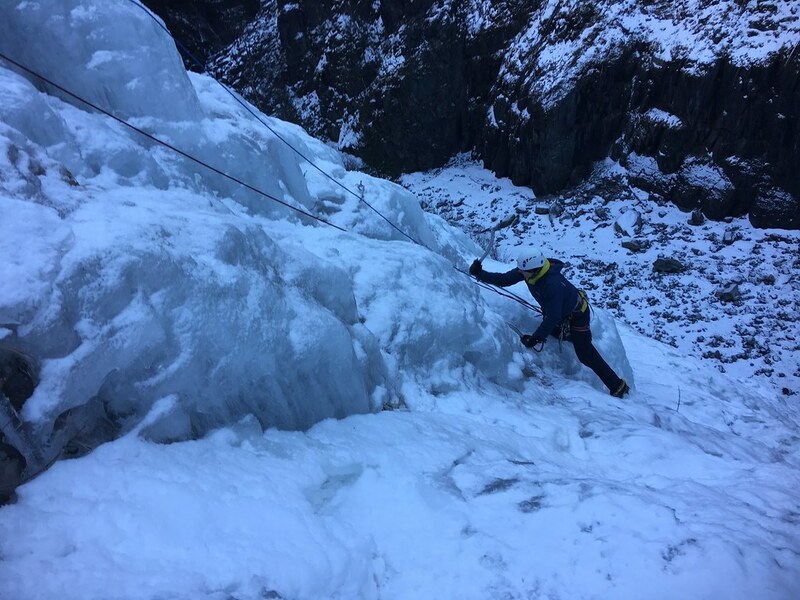 The snow was like slush and the rock beneath like sand, not reassuring as I climbed the rockface trying to find a secure crack to stick my axe in, to pull me up. 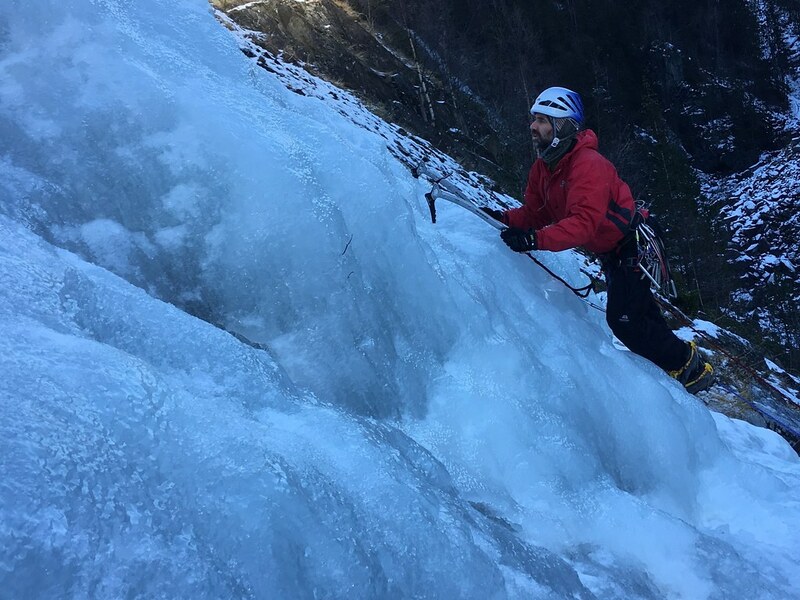 There hadn’t been good conditions for alpine routes the week we were in Chamonix so being able to get onto anything felt like a bonus. 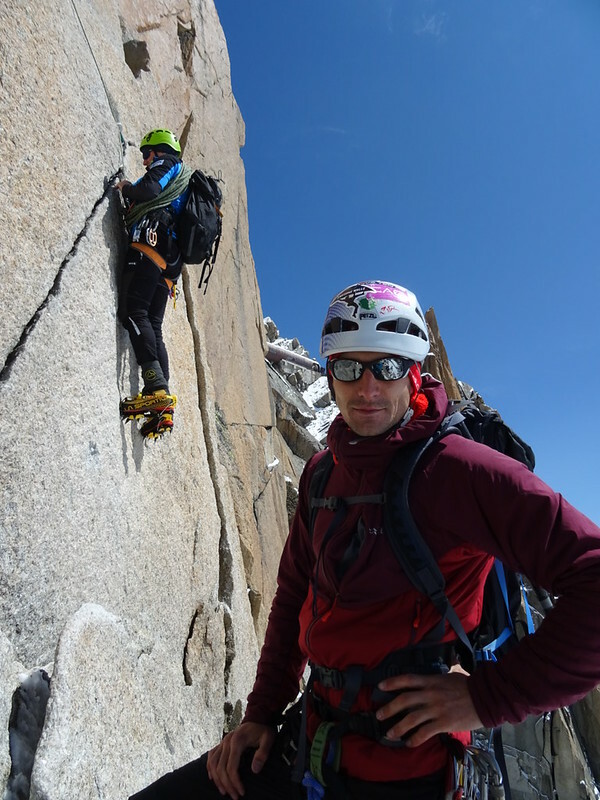 The Pointe Lachenal Traverse is relatively easy to access via the Midi cable car and the snow arête descent. 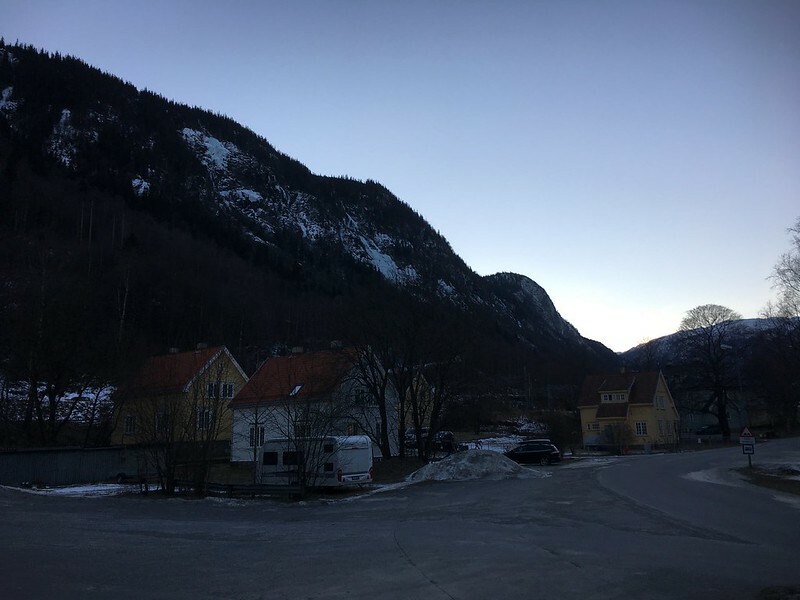 There was some trepidation as we headed up the cable car with the visibility being poor and it being considerable colder and windier than it had been for the last few days. At least it had stopped raining for long enough so we could get high. 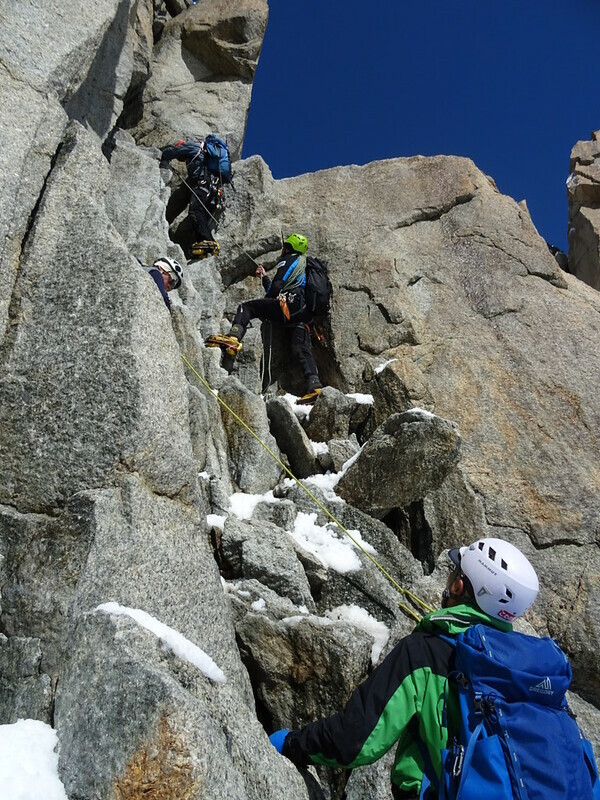 I led the descent down the snow arête noting a lot more fresh snow than when we’d climbed a few days before on the Cosmiques Arete. 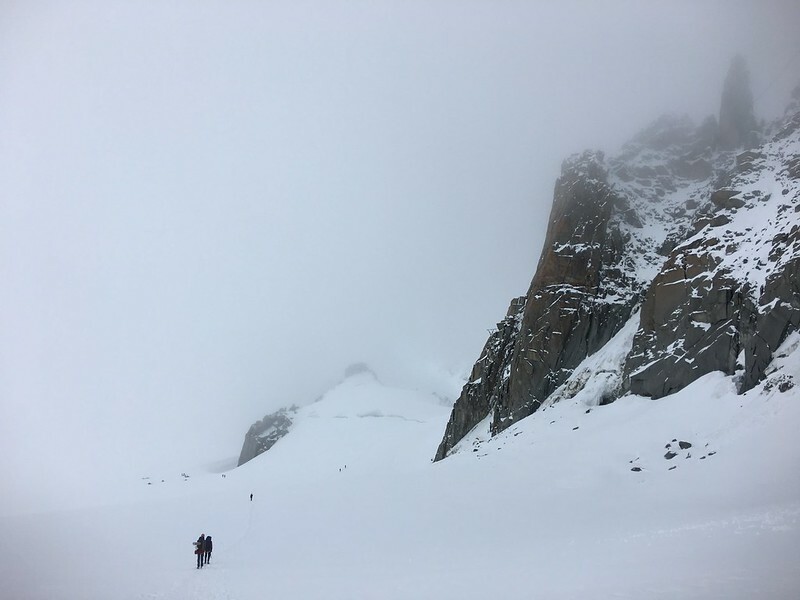 As we descended down to the glacier the visibility dropped to about 100m, and at this point we were also breaking trail with the only other climbers already out heading for the Cosmiques. 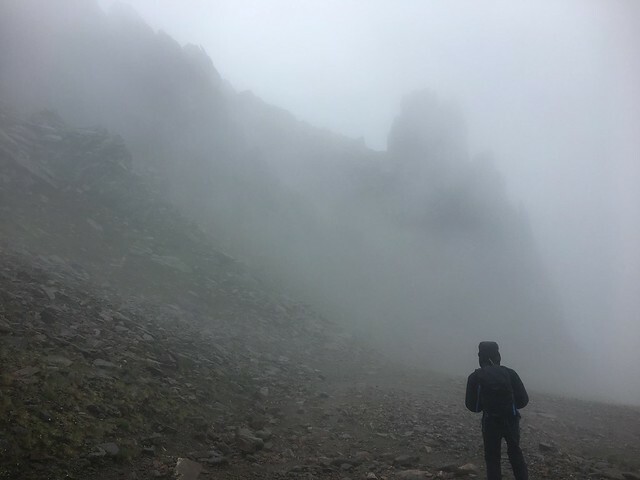 It felt a lot like a wintery day in Scotland, minus the horizontal hail against my face. 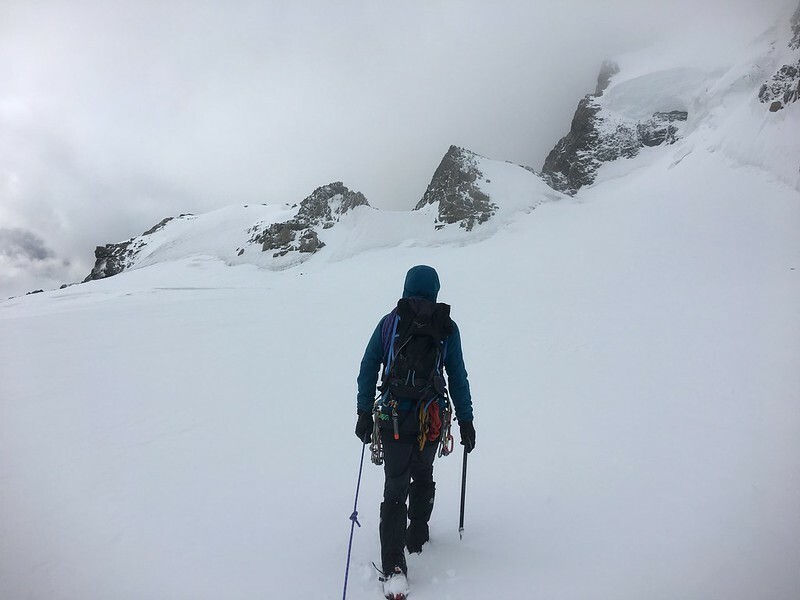 As we headed across the blank space, being mindful of the glacier beneath our feet, we met two young alpinists looking for a route. 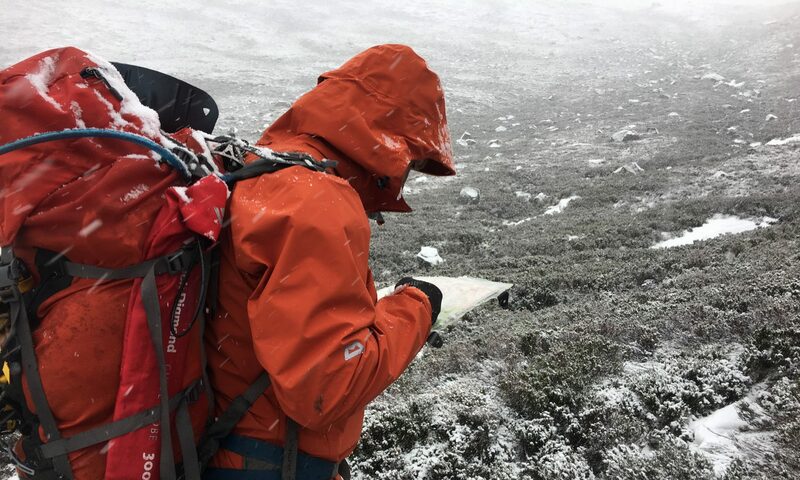 With no map and little concept of how far across the glacier they had to descend to get to their desired climb, we made sure they had at least a good photograph of our map before they headed off into the fog. 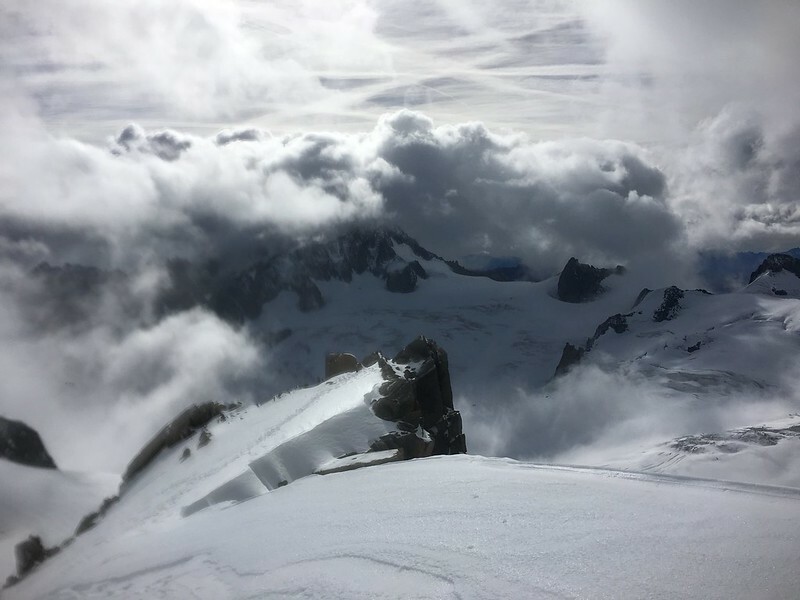 At least the cloud lifted as we got near Pointe Lachenal so we had a good view of the snow conditions on the route. Bare ice in parts. 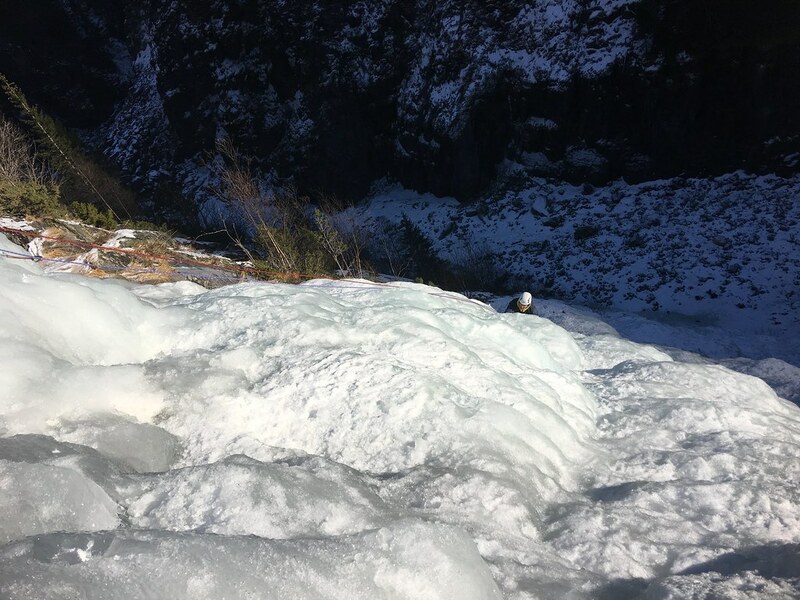 Due to the strong wind that had accompanied the last few days snow and rain, and the extremely warm temperatures that had preceded that, the ascent onto the ridge had been completely scoured and had become ice with the constant freeze/thaw. 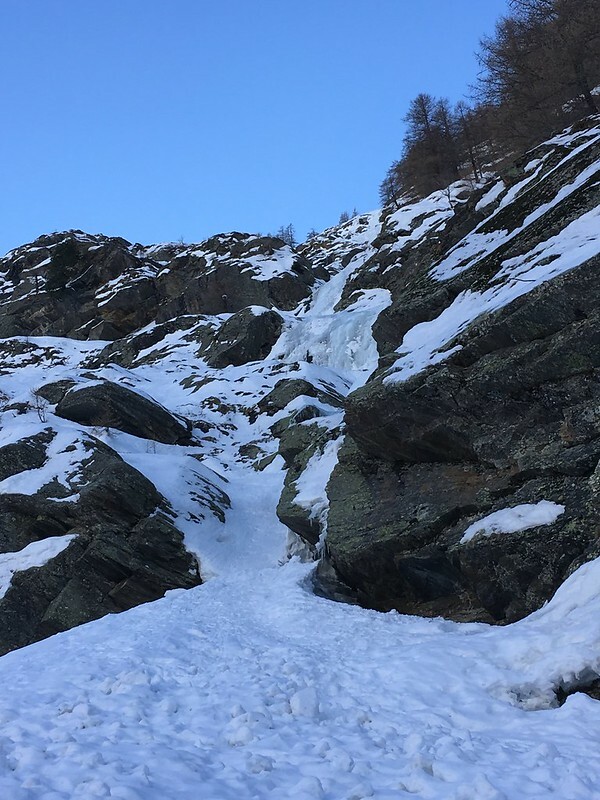 Whilst the ascent onto Pointe Lachenal isn’t difficult we had to ensure we were properly protected, so ice screws were deployed. This was the advantage of moving as a pair as we could do this with speed. 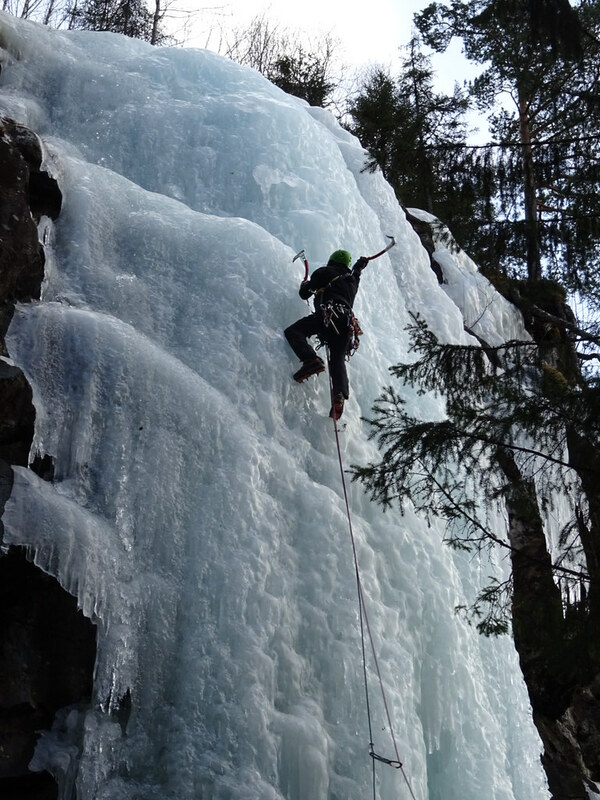 Unfortunately at this point my partner lost his sunglasses which merry whizzed off down the ice into the abyss below. For once we then started praying the sun didn’t come out otherwise he would be quickly snowblind. 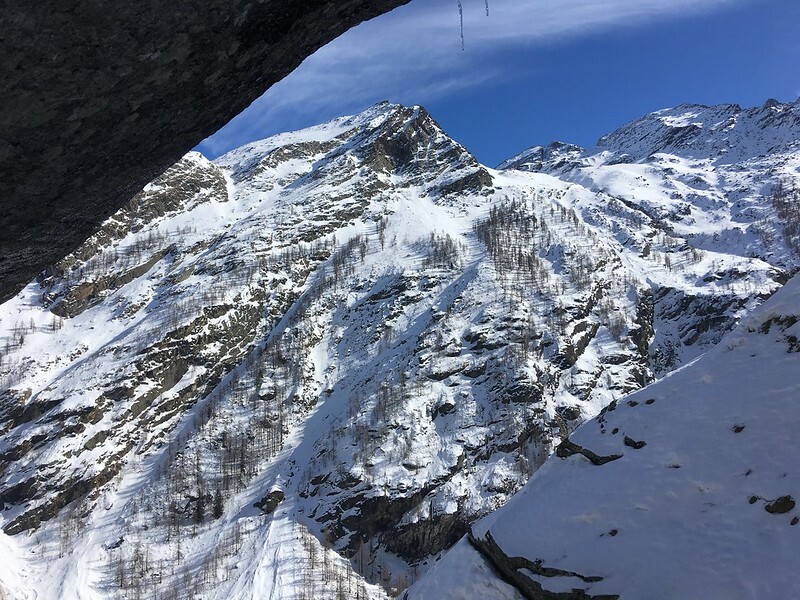 We climbed the bulge of snow on the left of the image below, and the route continues right across over the first two rock points to descend the snow on the right. The ridge is fairly wide with only one awkward step round a rock before you reach the abseil point half way along the route. 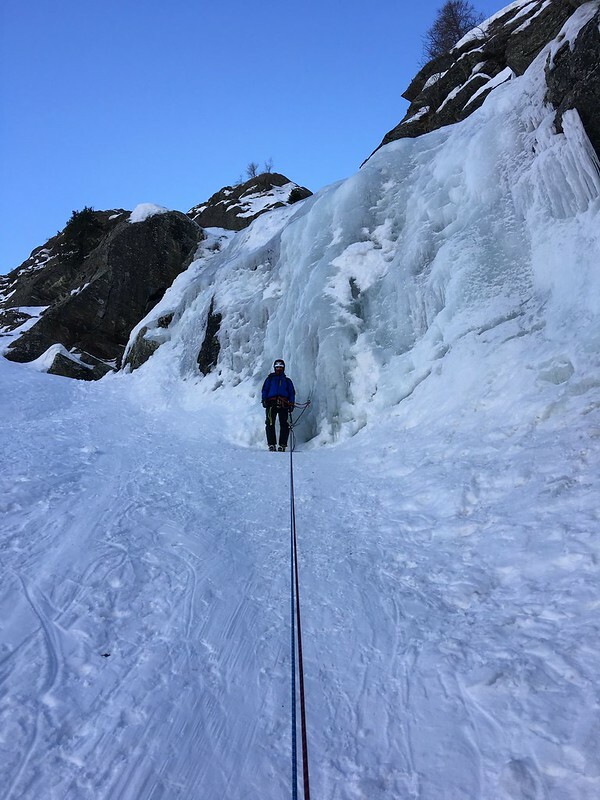 With the abseil complete it was a straightforward traverse of a snow slope to reach the crux of the route. 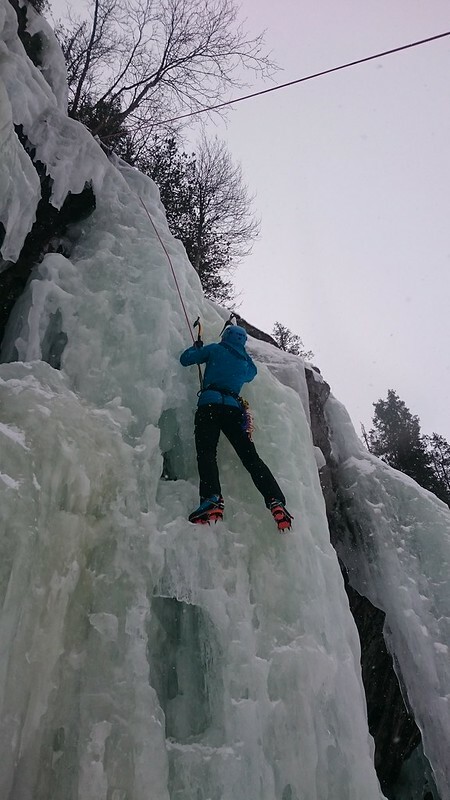 Ah lovely, more rock climbing in crampons. 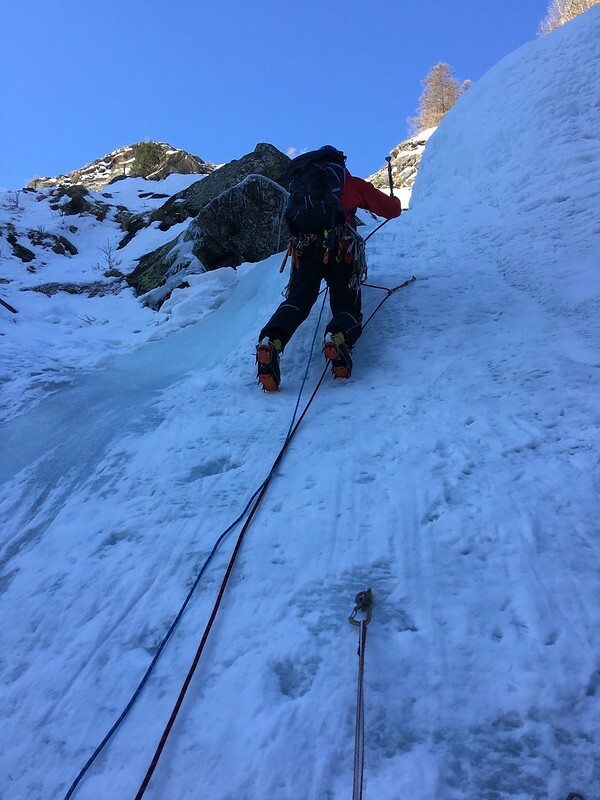 As it was, the crux wasn’t actually that complex but due to the poor snow conditions and the loose terrain on the chimneys meant that it took a long time for my partner to find a good line to take up the route. 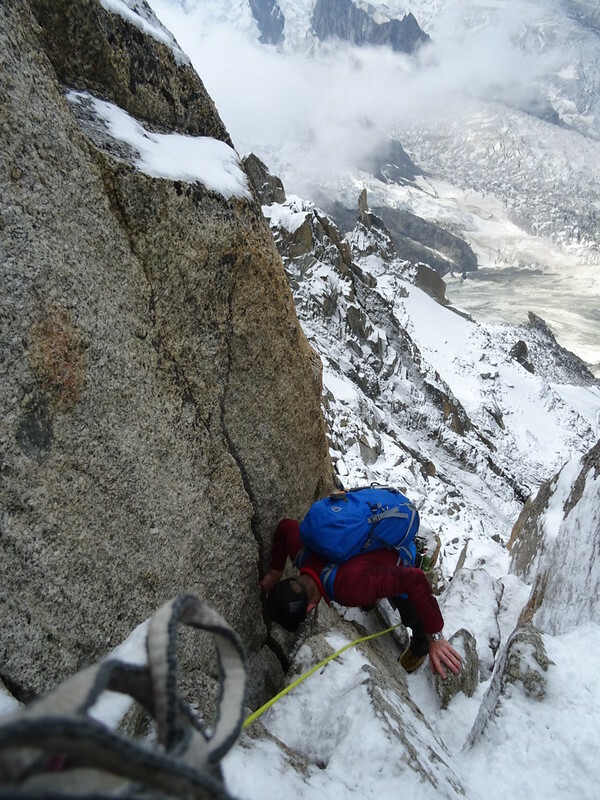 Here’s Andy topping out behind me; our group of three friends had caught us up on the ascent of the crux. 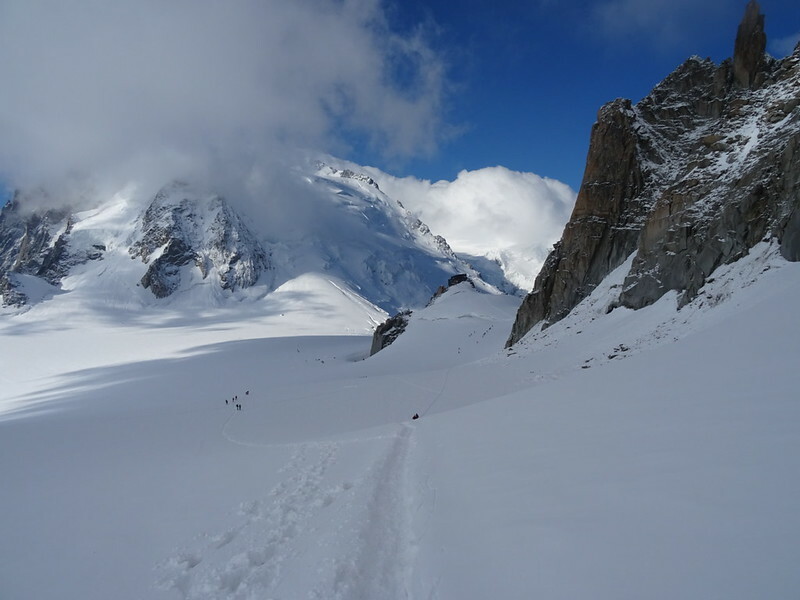 The rest of the group were off to the Cosmiques hut to do the arete the following day. 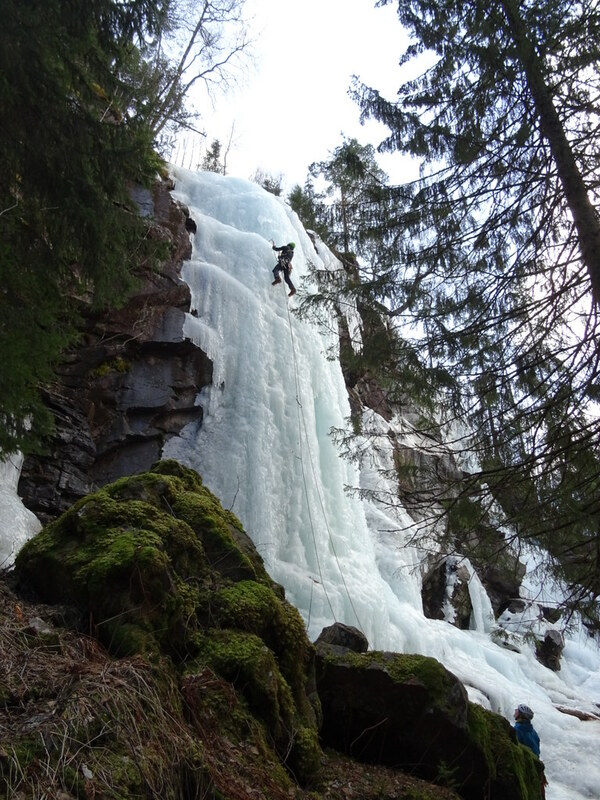 Having already done this a few days earlier, and my partner minus sunglasses at midday, we decided to head back. 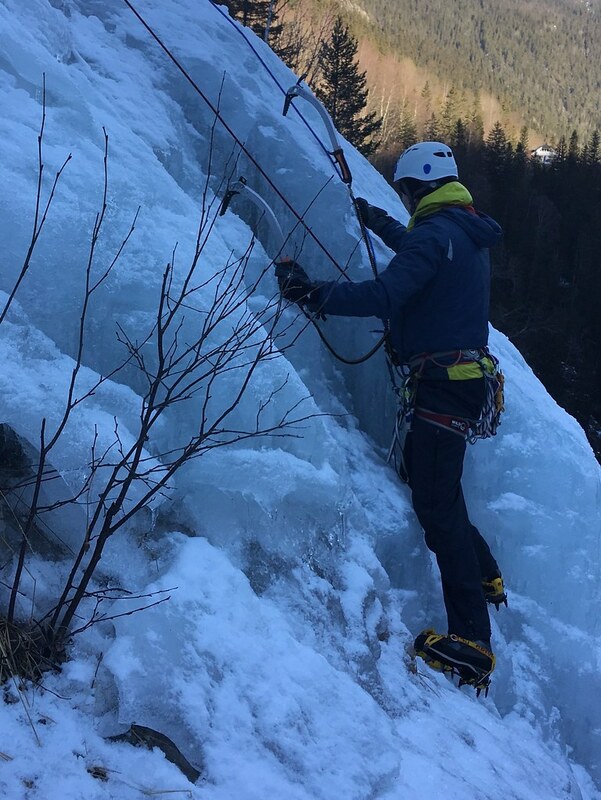 If there’s one thing I learnt doing Alpine climbing is that I have to stop underestimating myself and have more confidence in my abilities. 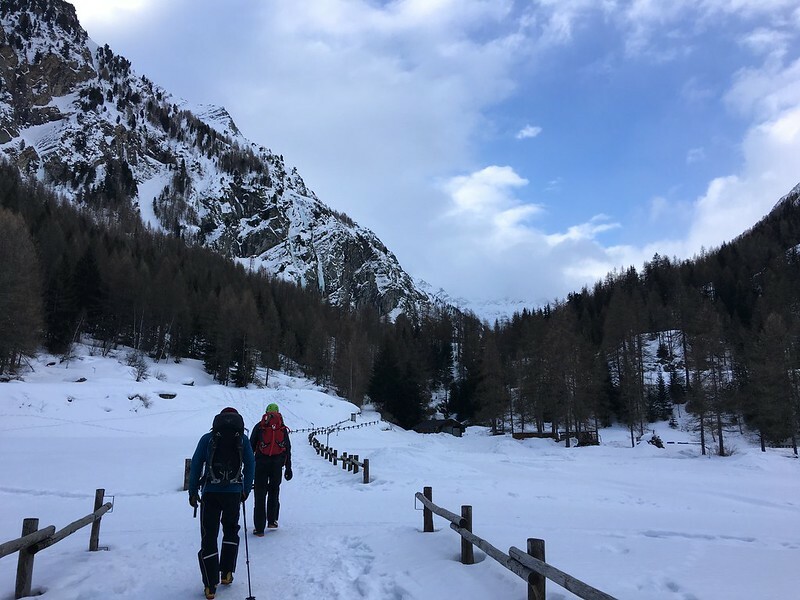 Before we had left the Midi station that morning there was a lot of grumbling within our group and amongst other alpinists about the poor snow conditions and poor visibility. 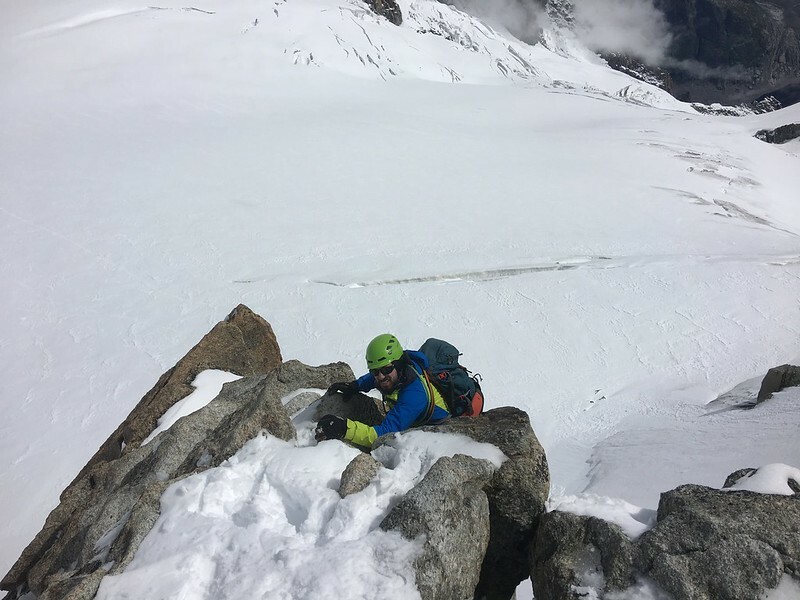 We had already seen two groups return from failing to get up Mont Blanc – poor snow conditions had led the Chamonix guides hut to recommend people did not try the mountain. We had certainly seen avalanches. 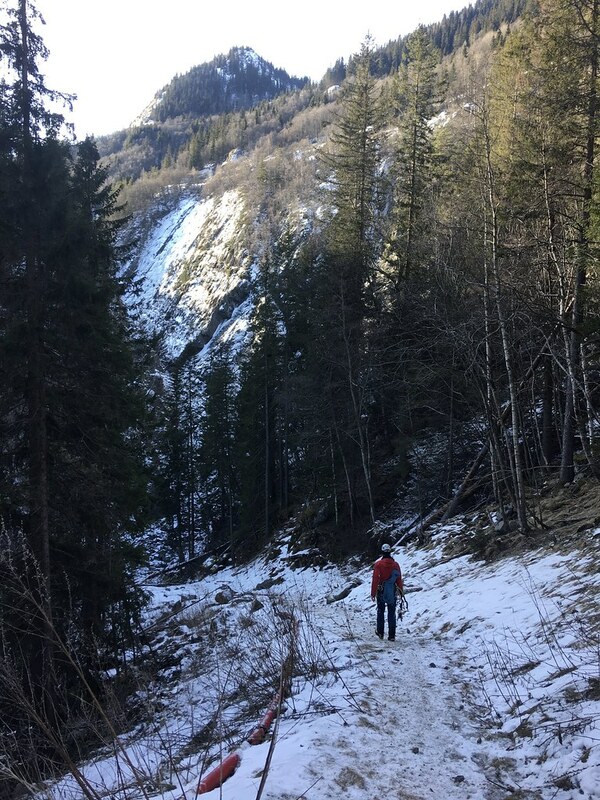 But I had felt confident in descending the snow arete and taking a look. 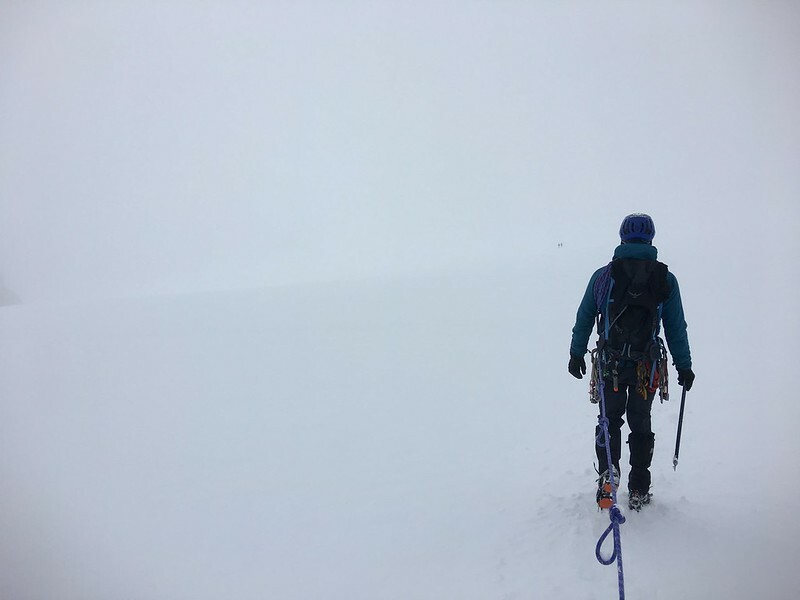 Being in the blank fog didn’t faze me, I had a compass and was roped to someone I trusted if one of us was unfortunate enough to end up in a glacier. And I was confident enough to deal with it if it was him. 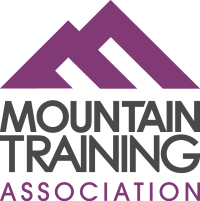 My last trip to the Alps led me to decide to do the Winter ML training, this trip has left me being confident to winter climb this season and consider other options too… watch this space! 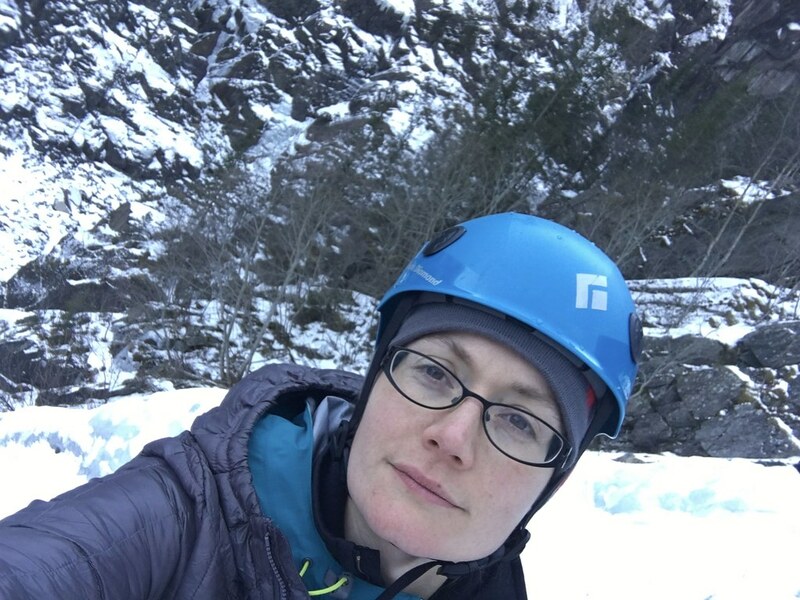 “Pull me up!” I yelled as I clung on with my fingers jammed in a narrow crack of slimy wet rock and my huge mountaineering boots failing to balance on a tiny ledge bearly visible. 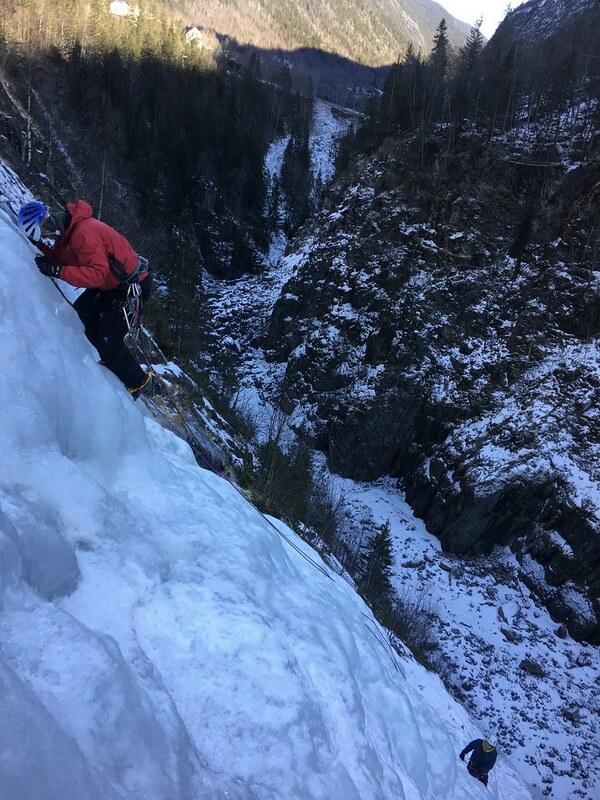 I was sliding and failing to remain attached to the rock face. 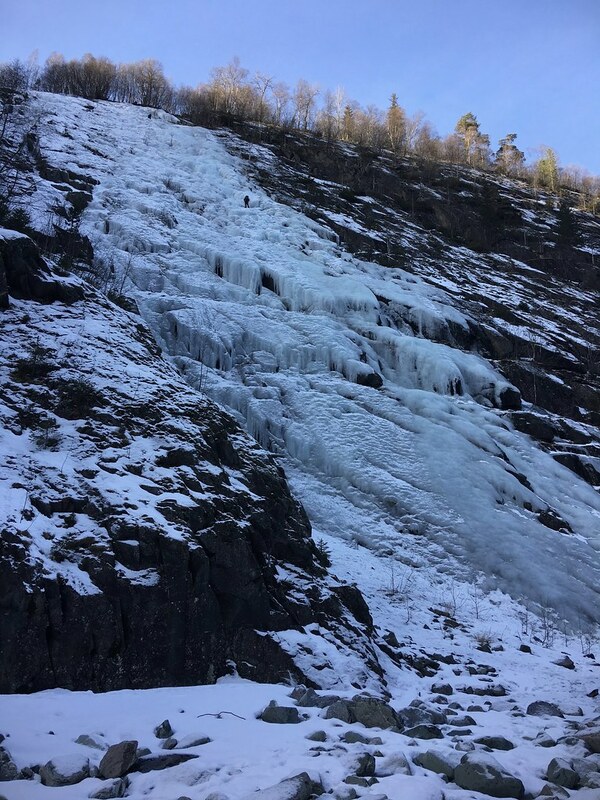 ‘There’s a reason there’s only English climbers up here today’ I thought as it crossed my mind we hadn’t seen anyone else climbing all day. 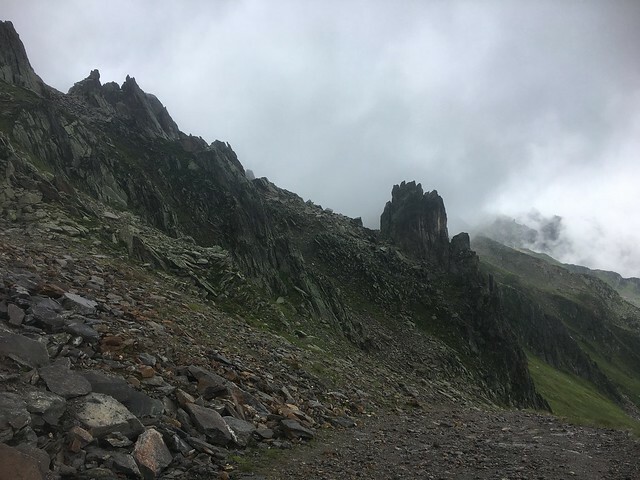 It was more than disappointing when after only one day of Alpine climbing we ended up trapped in the valley by poor weather. Like good Brits who are used to torrential rain and getting soaked to the skin, we didn’t want a bit of rain to prevent us having a great holiday. 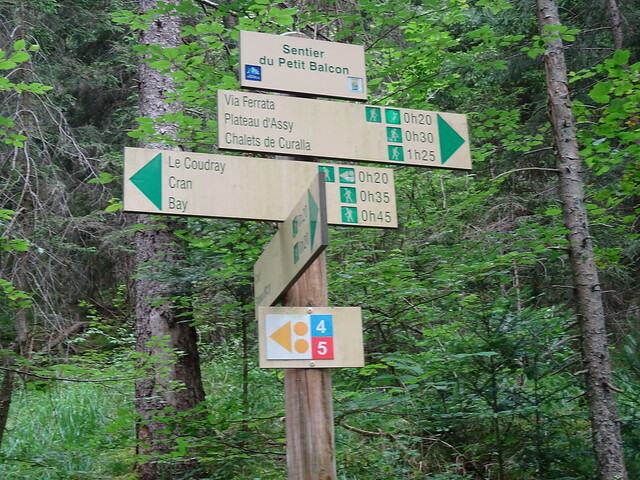 So after a good soaking on the first wet day walking through the woodlands, we decided it wasn’t that wet really and headed out to Le Brevent to climb La Somone. 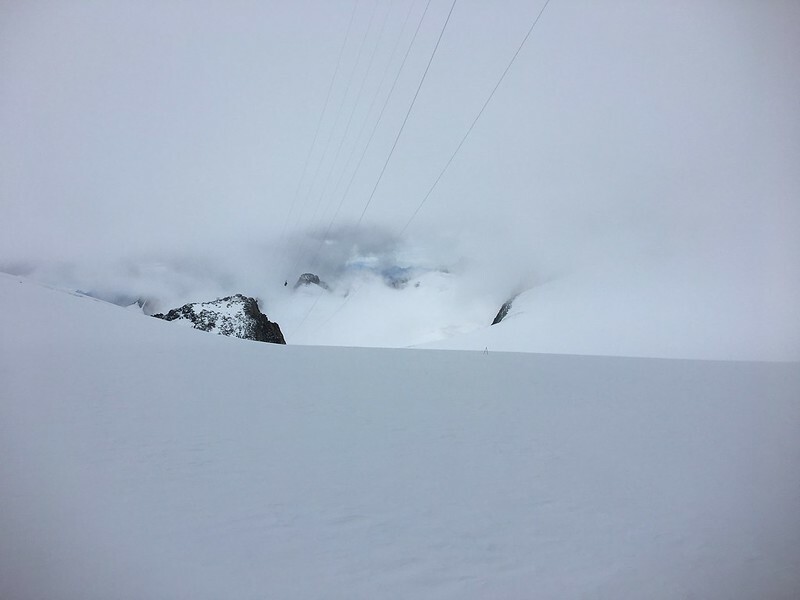 ‘It will be like climbing in Wales’ we remarked as we got on the empty cable car. 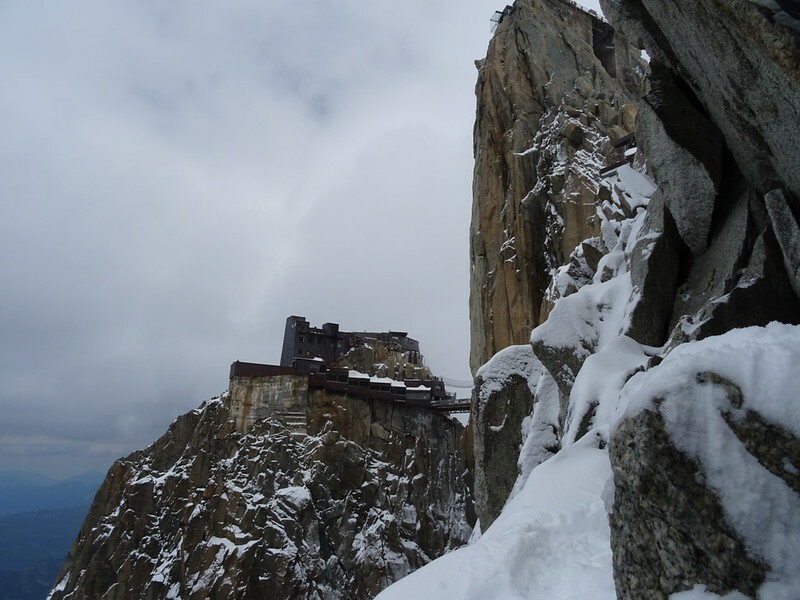 It was cold when we got off at the top of Le Brevent but not freezing so why not climb?! 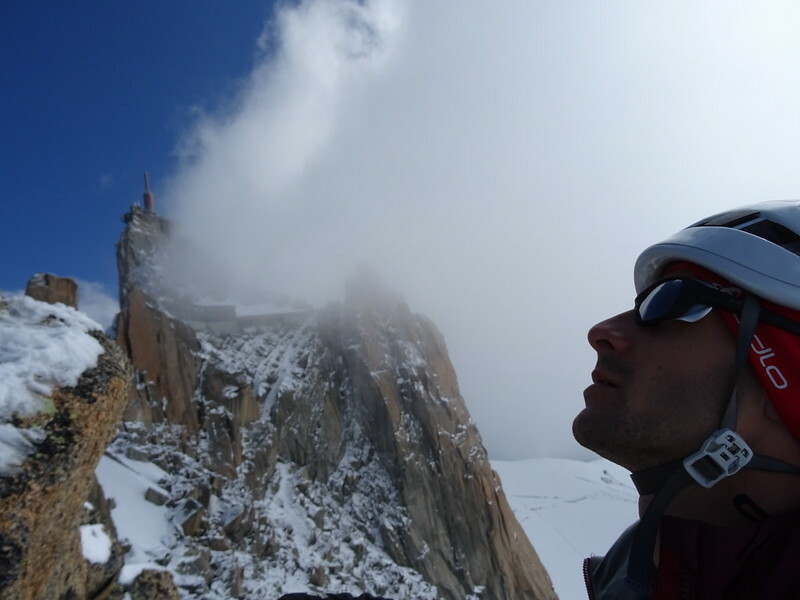 I’m not sure how we decided La Somone was a great route to climb, or how we found it in the mist. 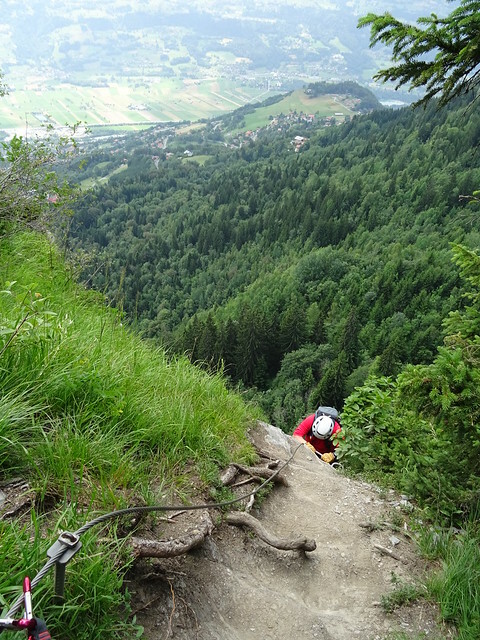 I’m also not sure why we hadn’t decided to stay in the Valley to climb something slightly less slimy. 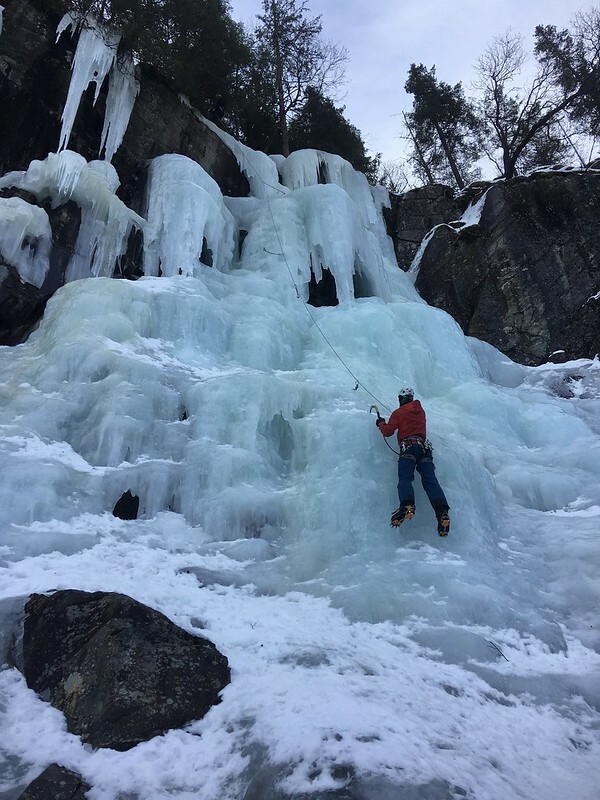 The thought did cross my mind that it might be a bit ridiculous when it started to snow as I stood at the bottom of the route belaying my partner. 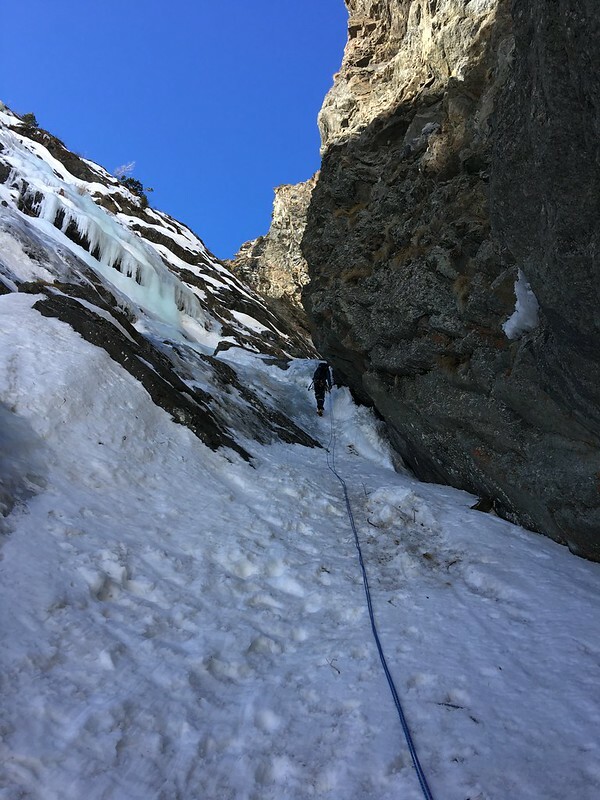 When it came for me to climb the third pitch – 4c – the ‘excellent flakes’ as described by the guidebook, were not really appealing for standing on in big mountaineering boots and especially not in the rain. 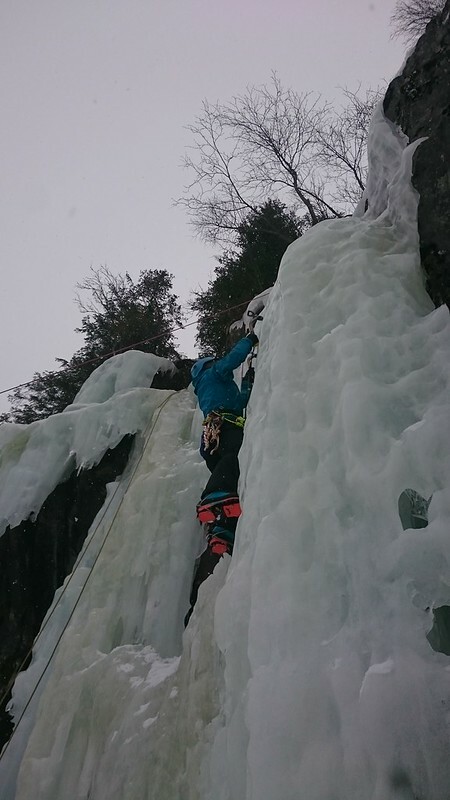 It wasn’t my finest hour wailing and sliding on the rock and ultimately requiring me to be hauled up. 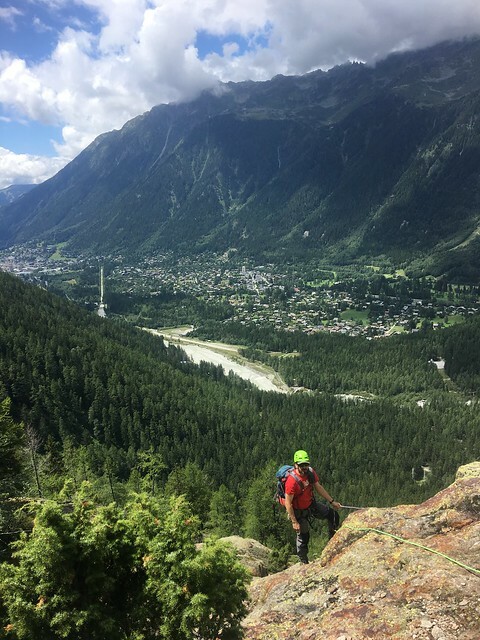 Perhaps I should have gone gear shopping in Chamonix? After the slime fest the prospect of sport climbing in the valley sunshine the next day was very appealing. Especially since the route finished at a Buvette where we could get lunch. 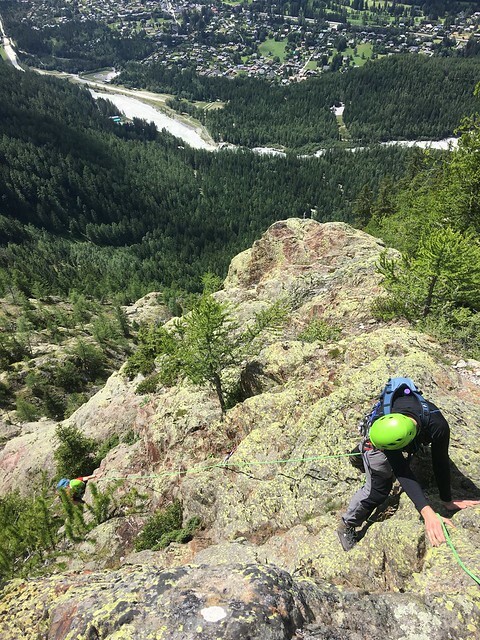 Vois Caline is one of three long multi-pitch routes at Les Mottets crag and at 350m of 3c climbing it was a nice scrambly route compared to the day before and one I had no worries about doing in mountaineering boots. 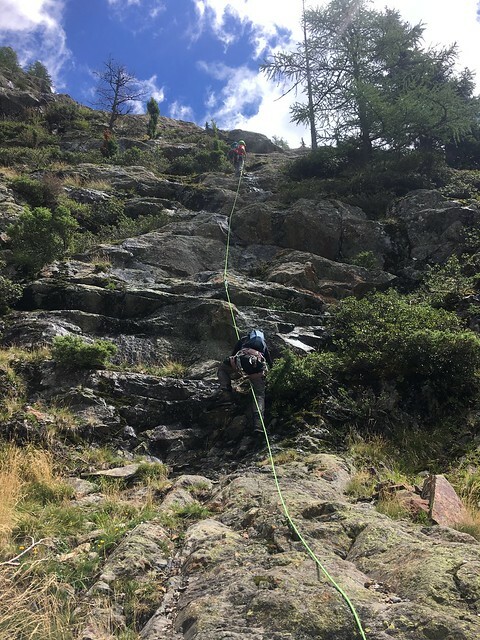 Ok the grade was easy, but I was still impressed with myself for leading three of the 5 pitches (my first ever sport climbing leads!) including one horribly damp slab traverse. 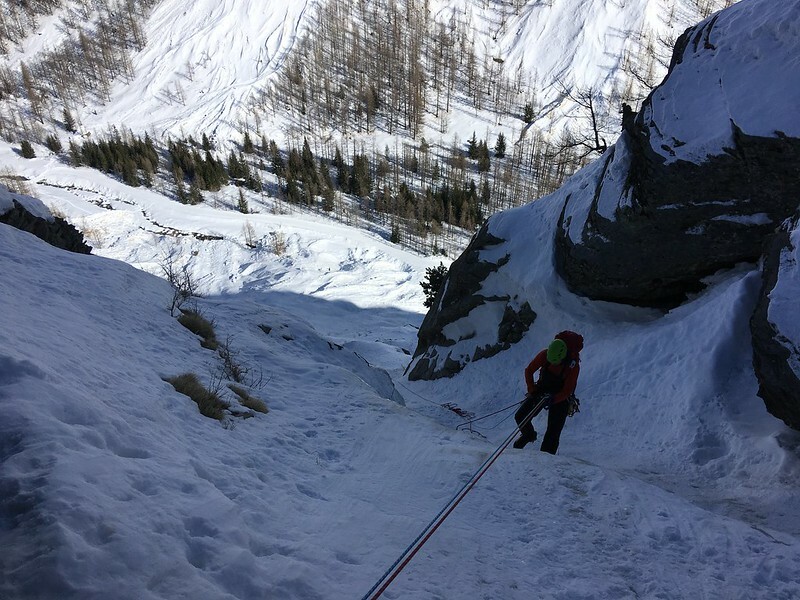 There’s plenty of bolts on this route and since its a low grade its easy to move together. 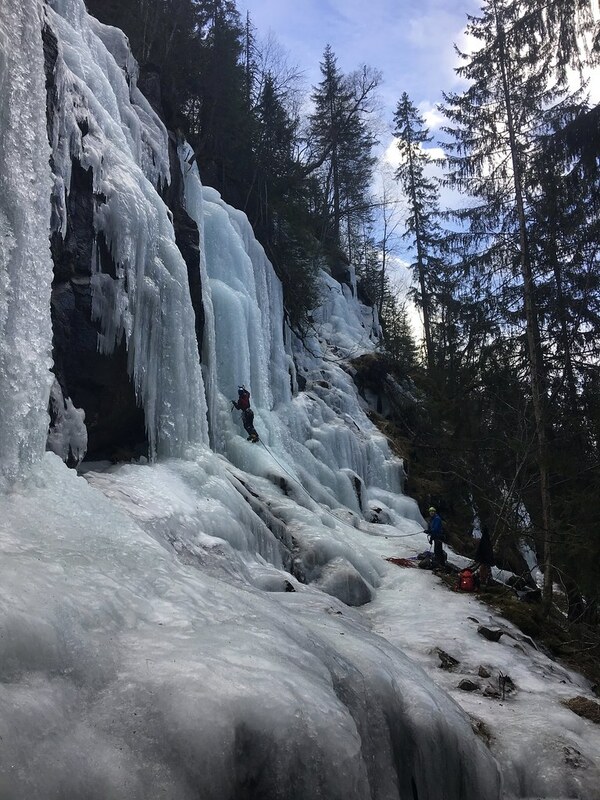 I really enjoyed this route which was a massive contrast to the day before! 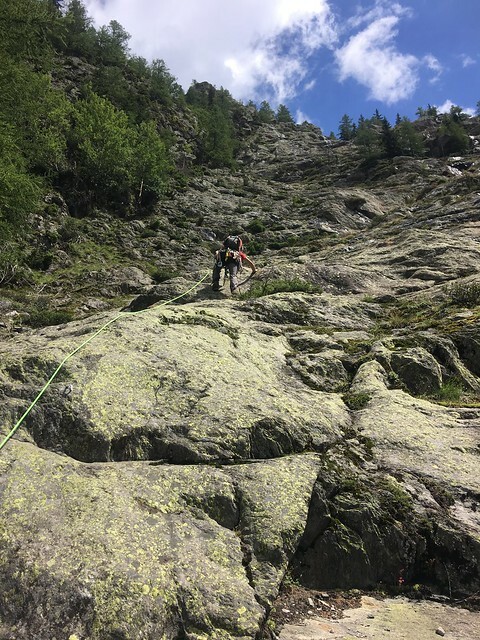 “I’m going to struggle with that crux pitch” I said, as I watched an Italian guide following his client up the rock face and wobbling on his crampon points as he went. 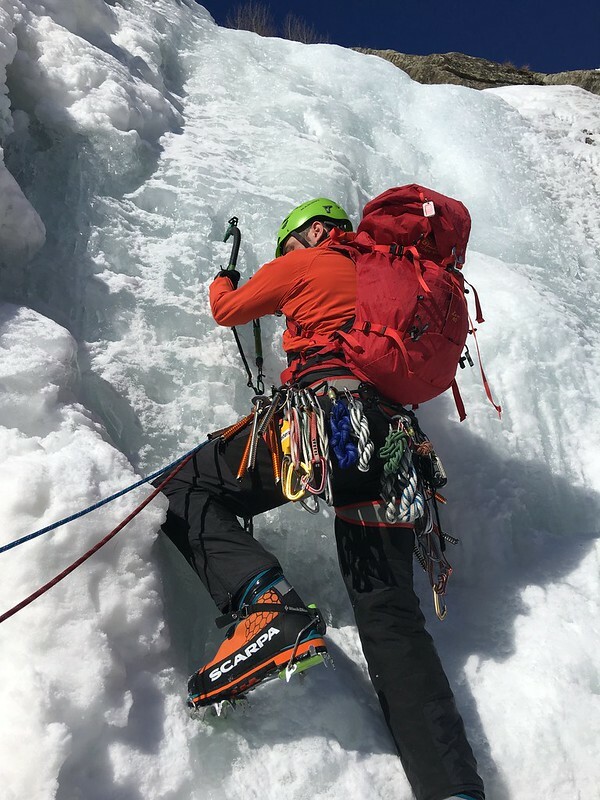 When his foot slipped it crossed my mind that if he was finding it difficult to keep his crampons on the tiny slots cut out of the face, I was going to do more than struggle. 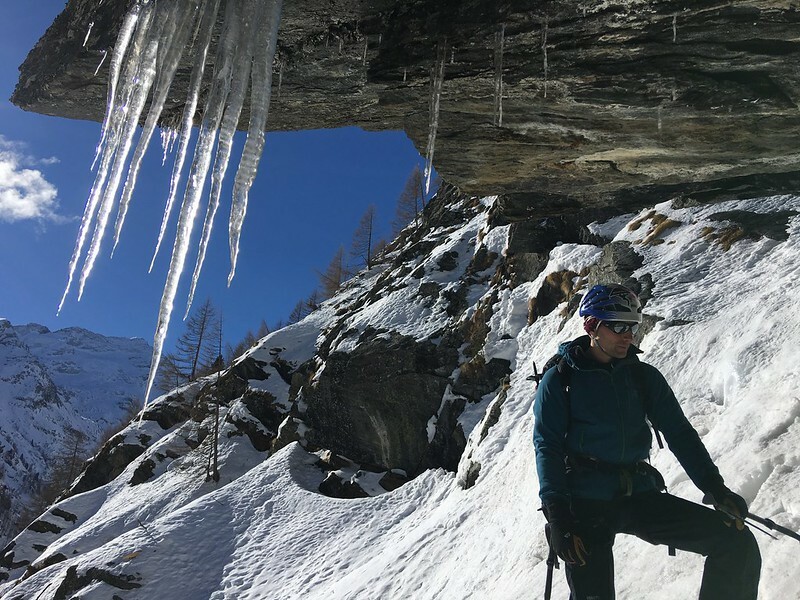 I started the year with a goal to do harder Alpine routes, so when the KMC organised a trip to Chamonix it was a perfect opportunity to get high and tackle more complicated terrain. My ultimate goal requires me to have all the skills I need to no longer rely on anyone else. I love being out the snow, be it the harshest winter in Scotland or Alpine days in the sunshine. I know though that these will always lead me to a moment where I’m muttering under my breathe, or worse swearing out loud. But for all the complaining I know that I’m capable and just need to get on with it. 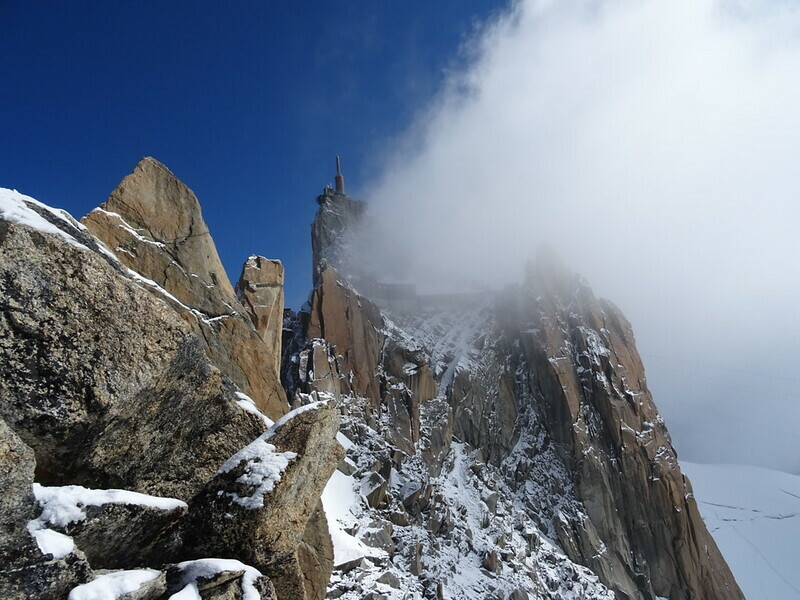 The Cosmiques Arête is a 350 metre ridge of climbing and scrambling. 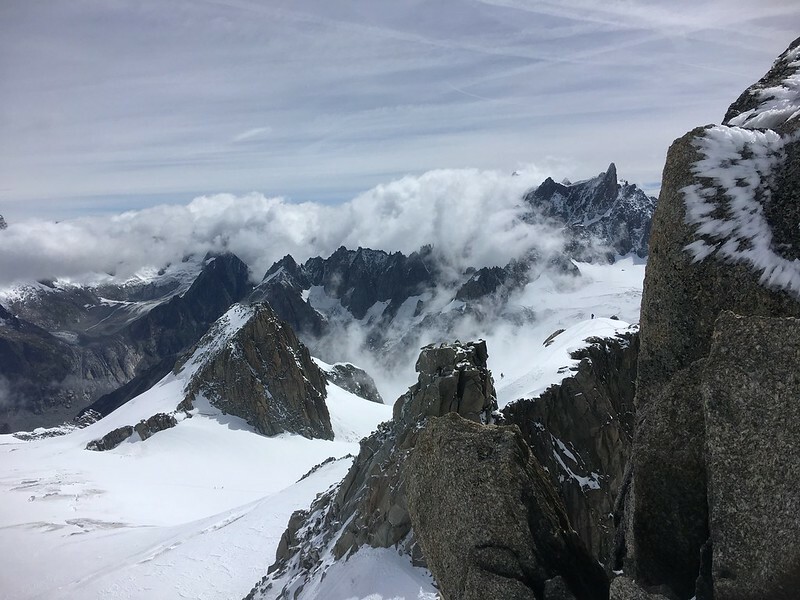 The guidebook recommends around 4 hours, but you need to factor in the 1 hour of descending the snow arête from the Aguille de Midi station and crossing the glacier, and any potential queue you might encounter on this popular route. 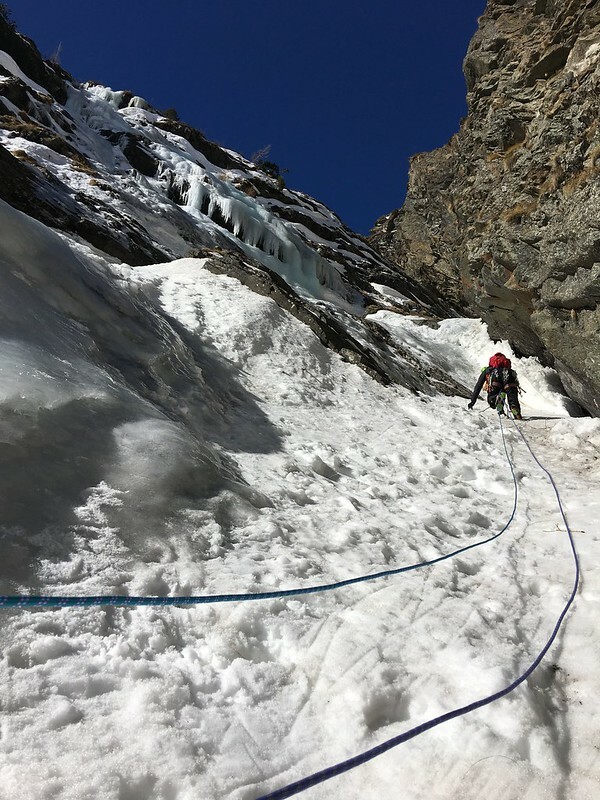 I’ve previously only done Alpine routes which require basic winter skills, ability to walk in crampons and front point up snow slopes. 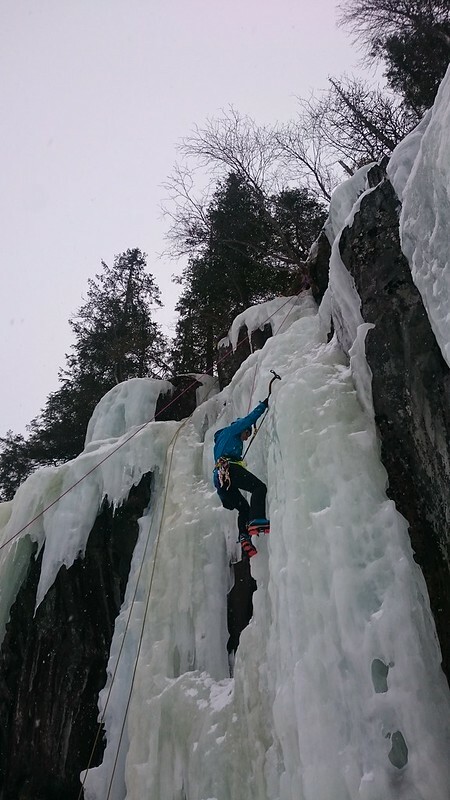 But after a winter ice climbing in Norway I was ready for routes that were more challenging. 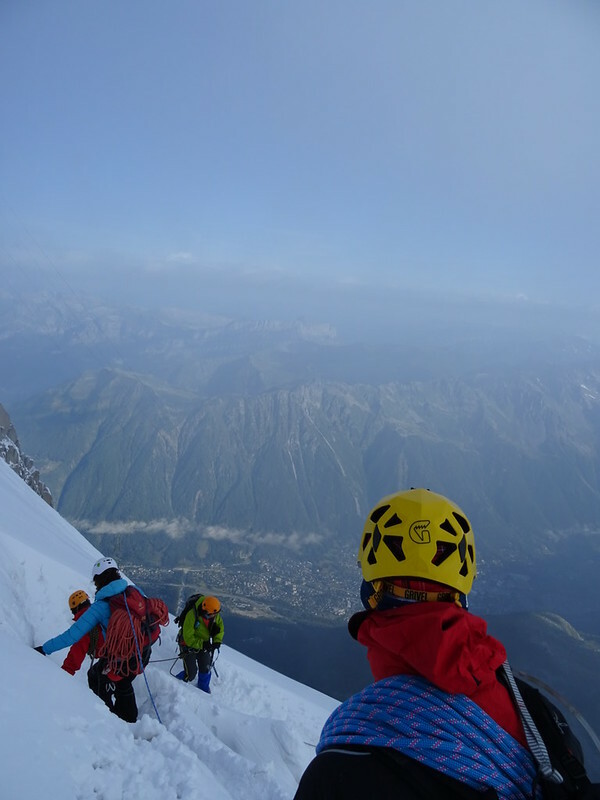 I was excited when I led us out of the Midi station and we descended the steep snow slope. 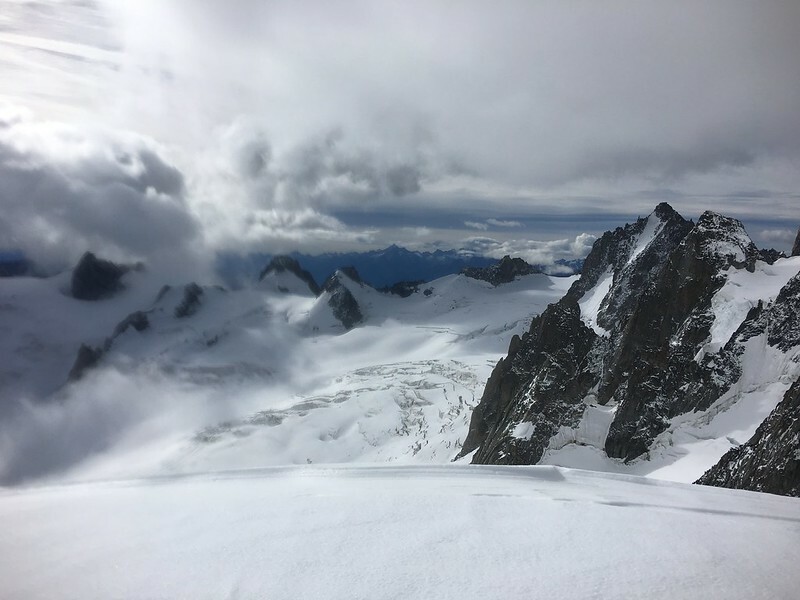 Looking down on Chamonix from 3800m is always exciting. 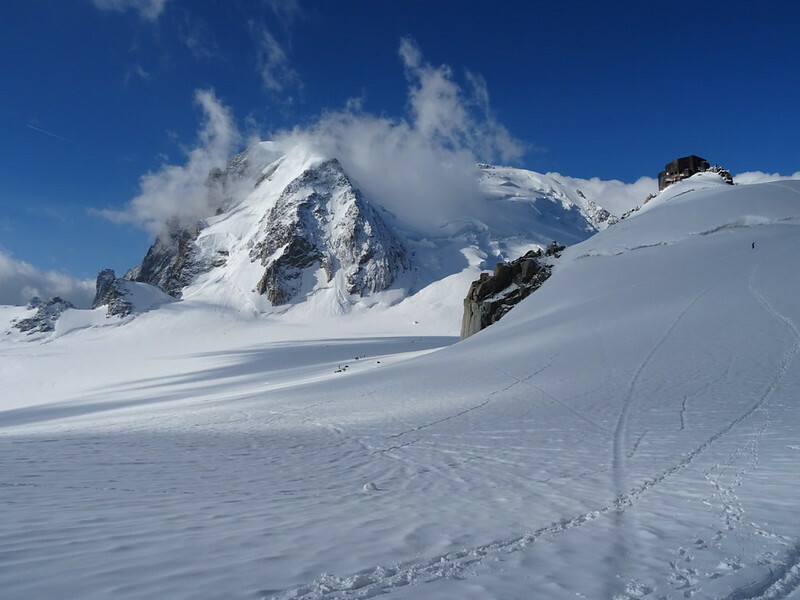 The route to the bottom of the ridge is relatively straightforward, following the arête to its end near the Cosmiques hut. 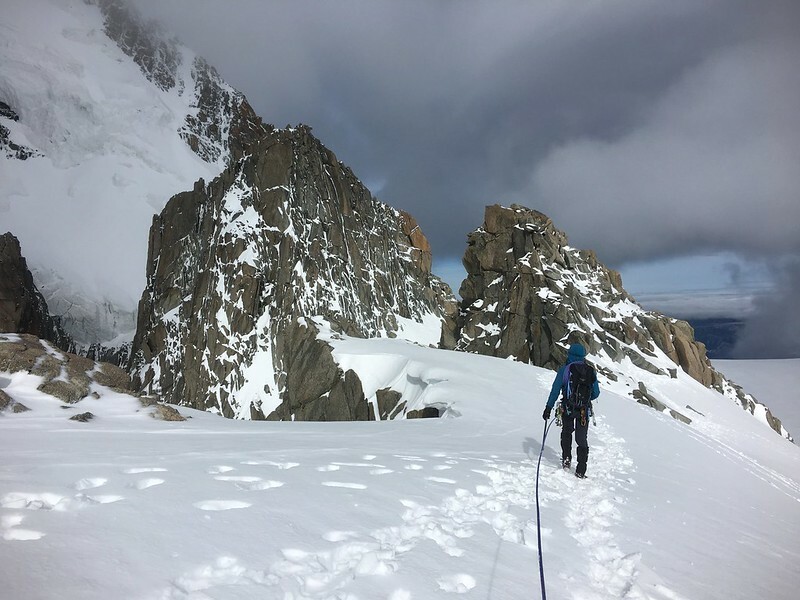 Much of the Cosmiques Arête is nothing more than a winter scramble. 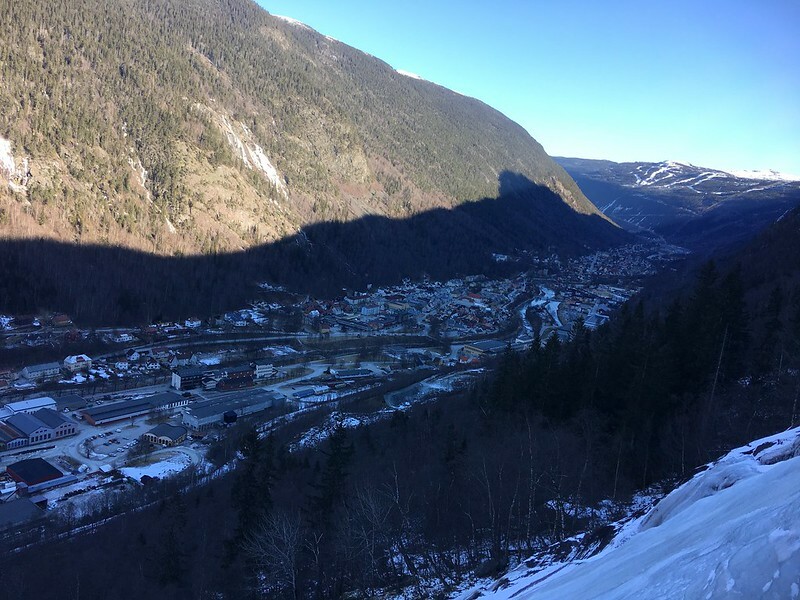 We had been unlucky to be tackling the route on Saturday and hadn’t been able to get on the first cable car, so our first challenge was to overtake as many of the groups as we could. Particularly the slower guided groups. My worst trait when I’m out is self doubt. 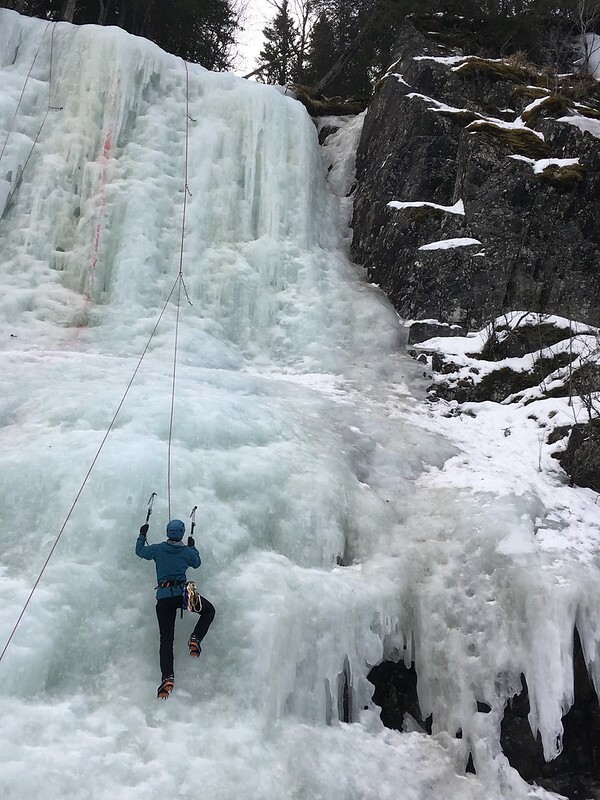 Can I really climb that route? 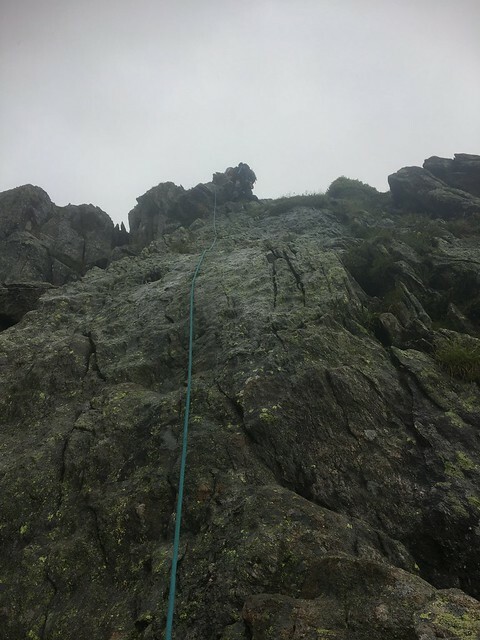 Is my prussic really wrapped right for this abseil and will it hold me? What’s after that difficult bit and can I do it? I find that questioning myself like this leads to a negative cycle of feeling like I can’t achieve something and lack of confidence in the skills I have. 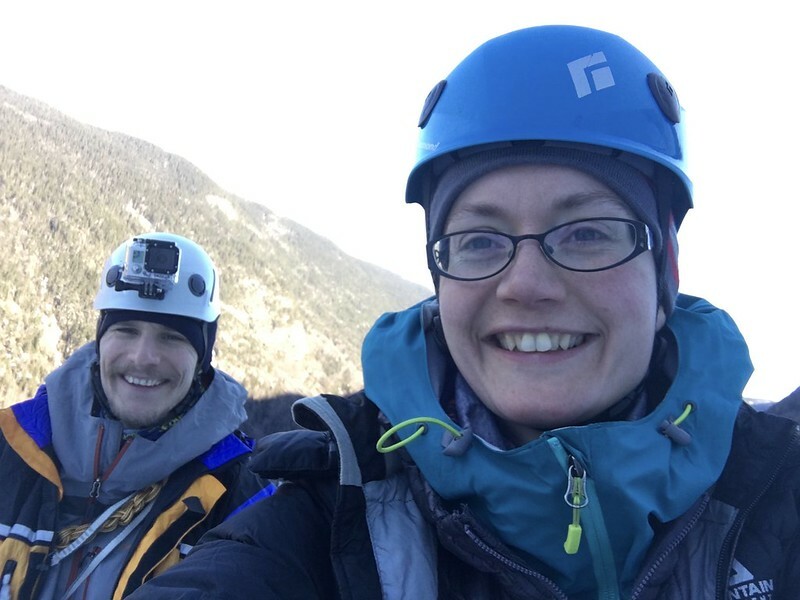 I’m not rubbish – I’ve been climbing for 2 years now and while I struggle with confidence and fear of leading, I’m perfectly capable of seconding VS routes when I put my mind to it. Even the odd HVS. 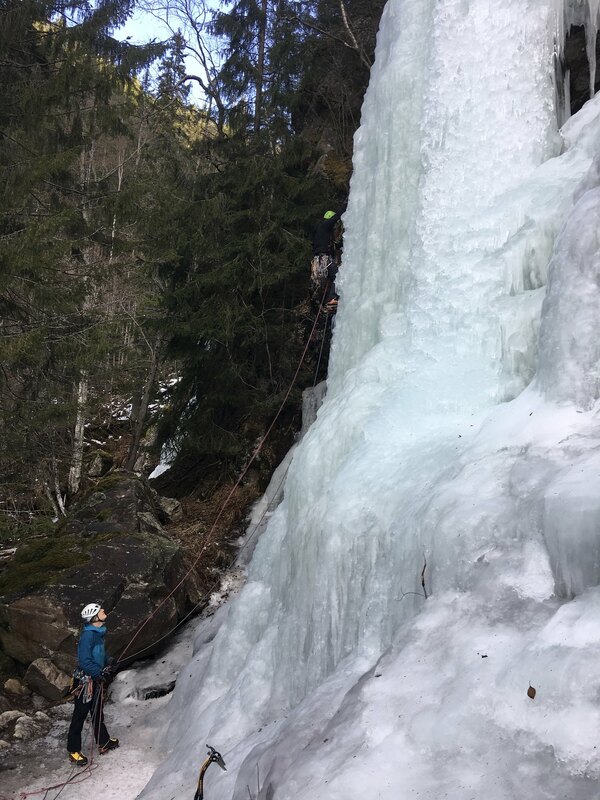 So when I arrived at the first abseil and muttered out loud that I needed my partner to check my abseil set up before he headed off, I immediately sabotaged myself. In giving a voice to my fears I made them real and also made him worry about my ability; which just made it worse. I hate people assuming I can’t do something; I hate being taken care of. The first abseil was straight forward and despite swinging into a chimney I had no problems. 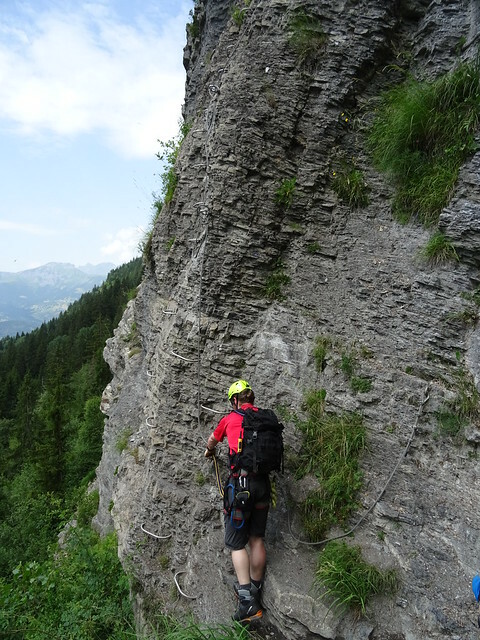 But voicing my fears meant my partner insisted on abseiling the next pitch together, which didn’t impress me. 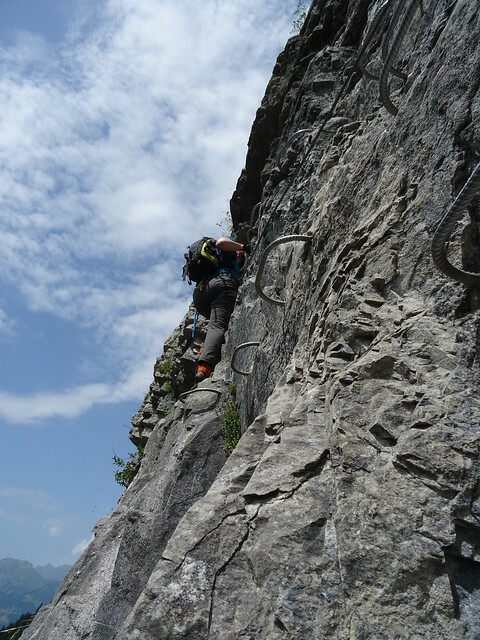 From the bottom of the abseils we traversed round to reach the crux – an 8m slab with a thin diagonal crack, graded ay 4c. 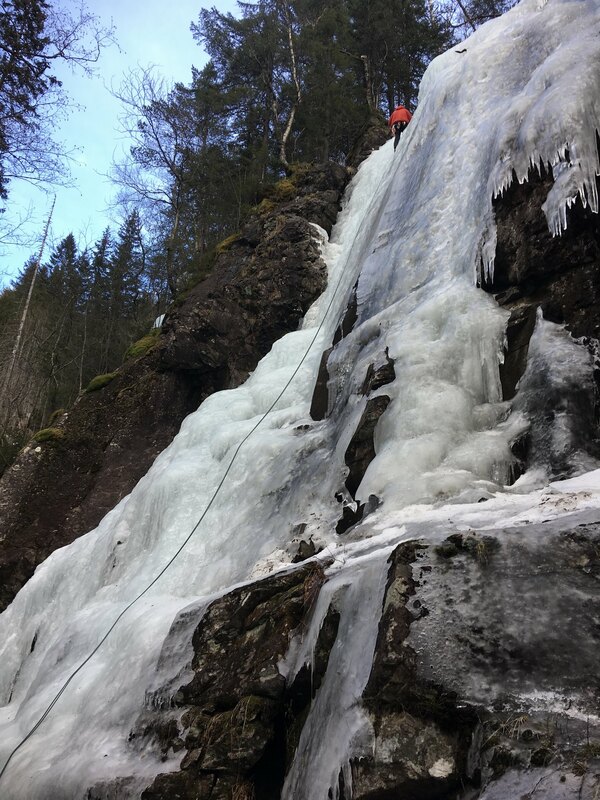 Should be easy enough, especially since there’s pre drilled pockets for crampons, and especially as someone had left a cam in the crack to pull on. 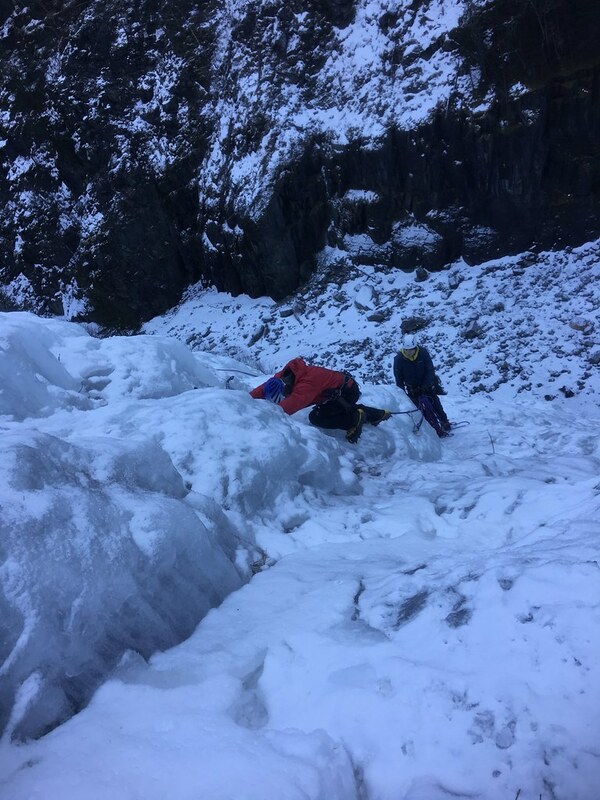 But climbing a rock face in crampons at altitude was not going to go well for me. Was it lack of skills or confidence? Did I just sabotage myself as I’d said out loud that I thought I was going to struggle? just look at the guy on the face! Thats not how I did it!! 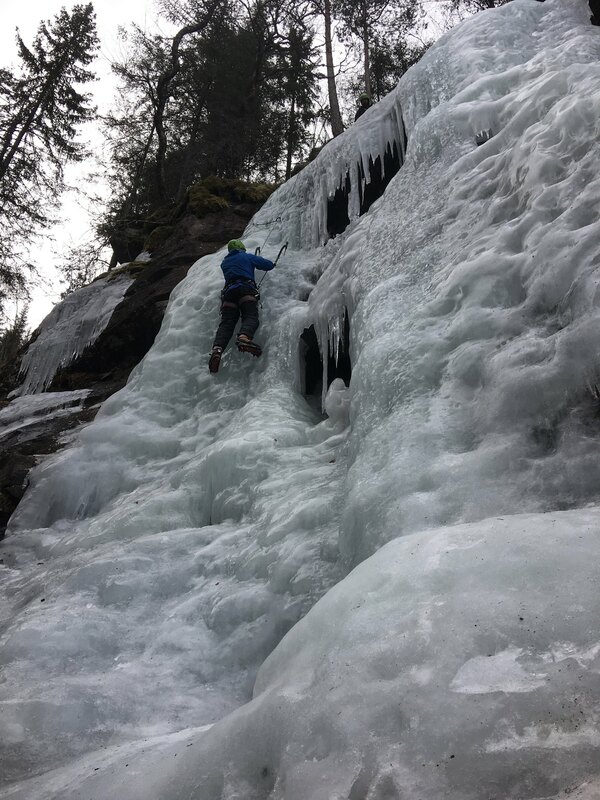 As I was dangling, struggling to get my crampon points to stay in the pockets and get my weak arms to pull me up the crack I discovered a general dislike of Alpine guides. Yes I caused a queue. But then there was one there before we arrived. Yes I complained and took ages. But there wasn’t any need for the French guides to be rude and abusive. (I’m generalising by saying French as the Italian guide directly behind me was encouraging and helpful). 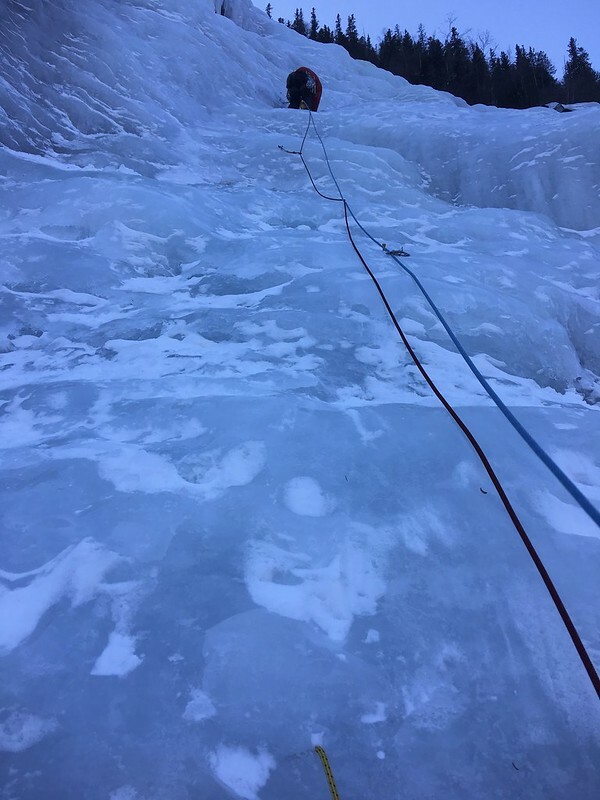 It was also clear once I’d dragged my sorry self up the face that the guides were dragging their clients along with little regard for them and relying on other climbers to help the clients make certain moves over rocks. 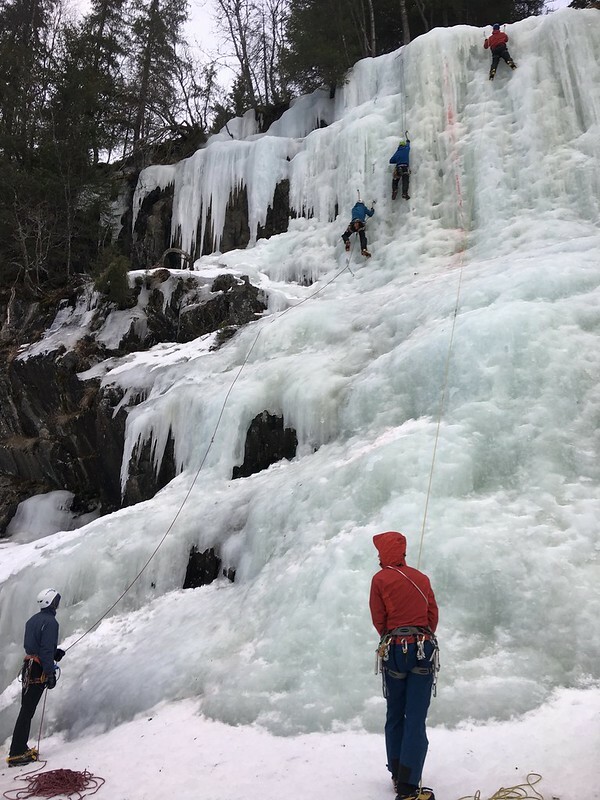 Their only concern was to get the route done as fast as possible, with some of the clients not even understanding to pull out gear from a route. I collected 2 cams and a sling as swag before the end of the route. 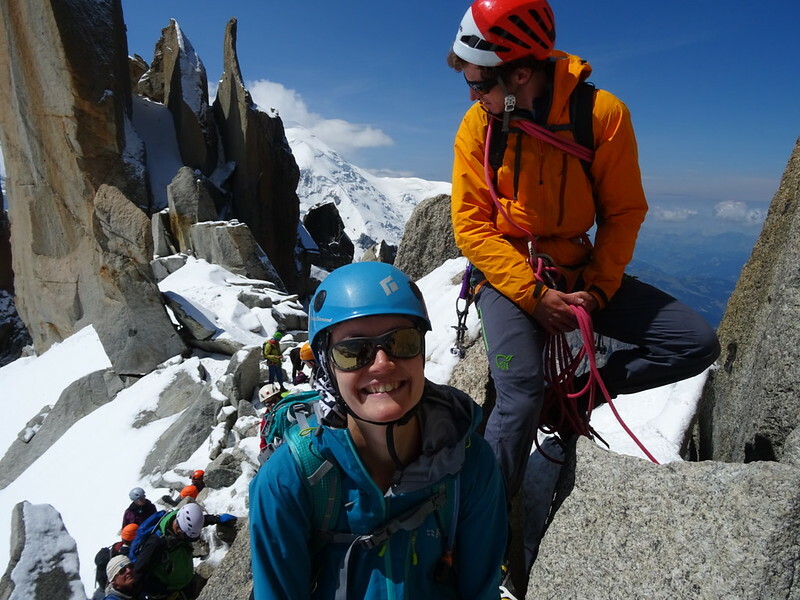 I know I’m generalising there, as we met some other guides I met during the course of the week who were amazing with their clients – but the ones I met on the Arête were not. 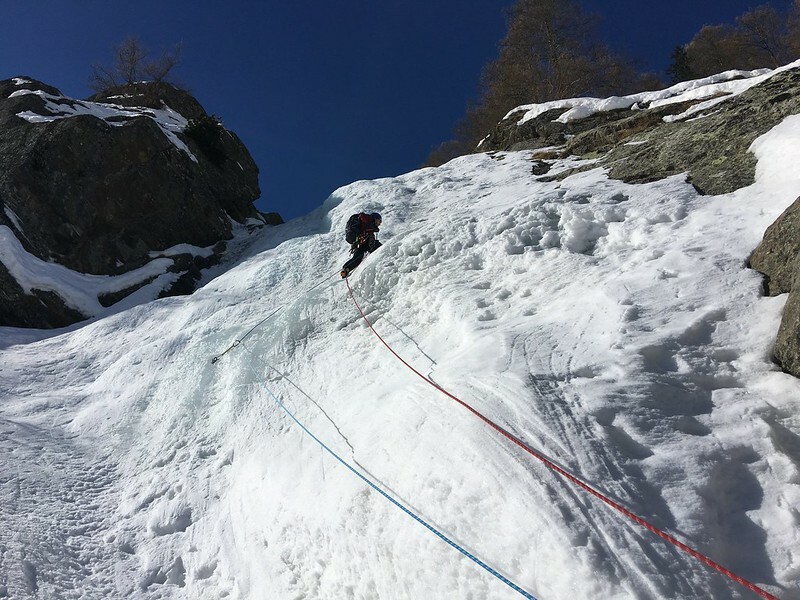 The final section of the arête isn’t complicated at all, a scramble up a steep gully onto the top and up the ladder to the top of the cable car. 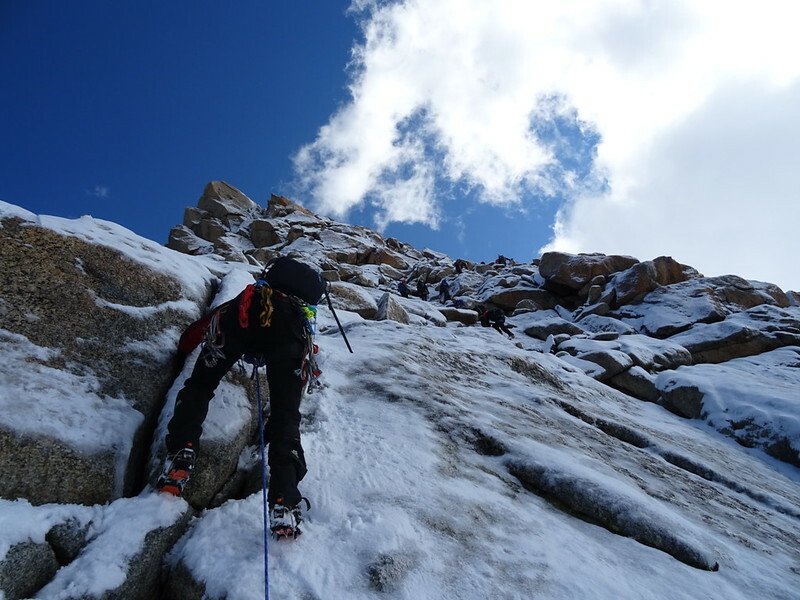 However, the queue at the crux and it being midday meant that there was a hoard of climbers now headed up the route and guides dragging clients behind them. It made me think of the images of climbers queuing on Everest and how I never want to be in that sort of place. 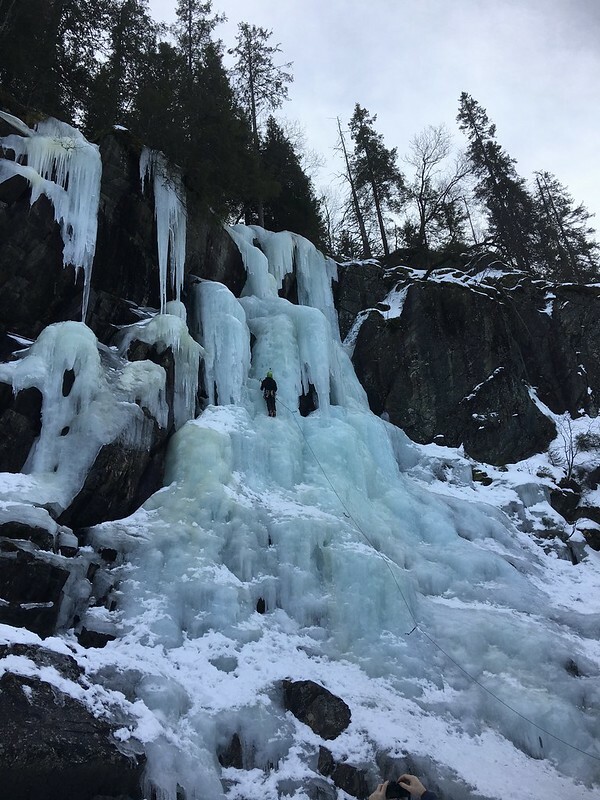 Its not what I want out of climbing routes. 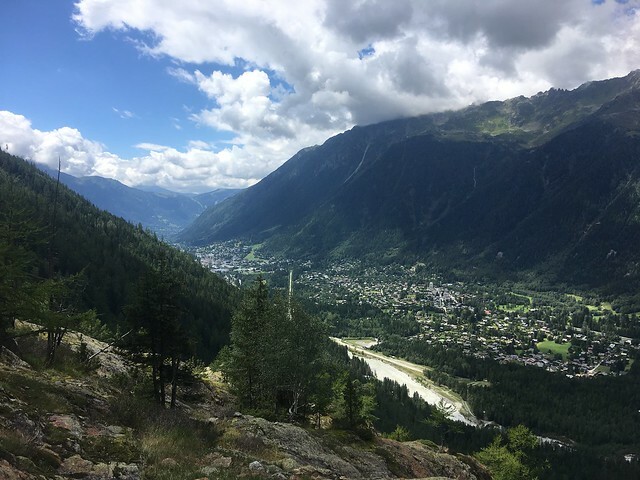 The joy of being fatigued at the end of completing any alpine route from the Midi is that if you look sufficiently knackered you can queue jump the hoards of tourists to get back down the cable car by looking a bit tired and smiling at the staff. I can easily adopt my best pathetic-tired face if it gets me to ice cream quicker! 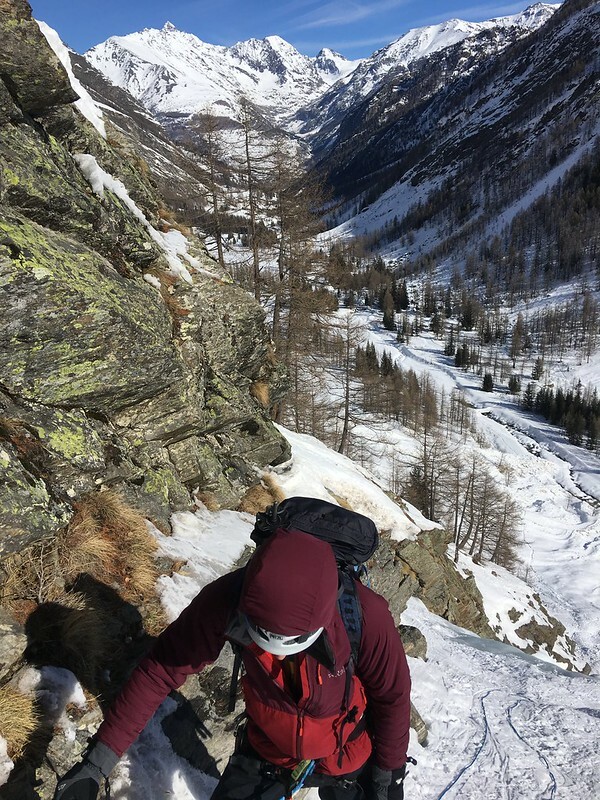 Since the weather had become cloudy and threatened rain we couldn’t head back up on to the snow so a few of us headed down the valley to Passy to do the Via Ferrata called Curalla. 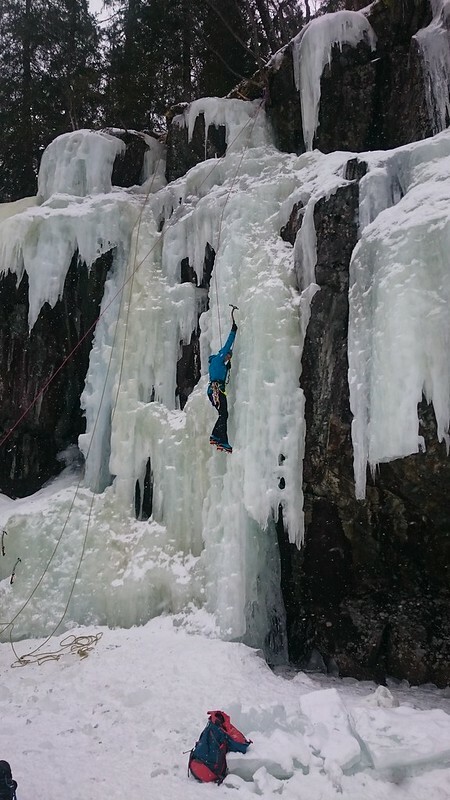 Graded in our Cicerone guide as VF2B and on UKclimbing as VF1B I was very confident about being able to manage this. 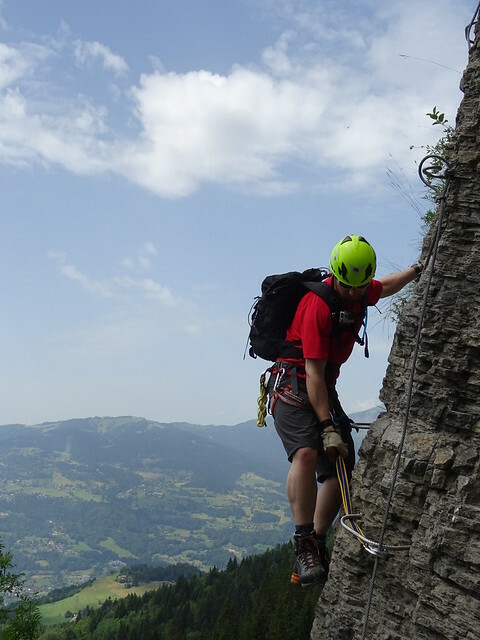 I’d done harder grades in the Dolomites last year – or so I thought. However it seems the French have a different opinion about grades. 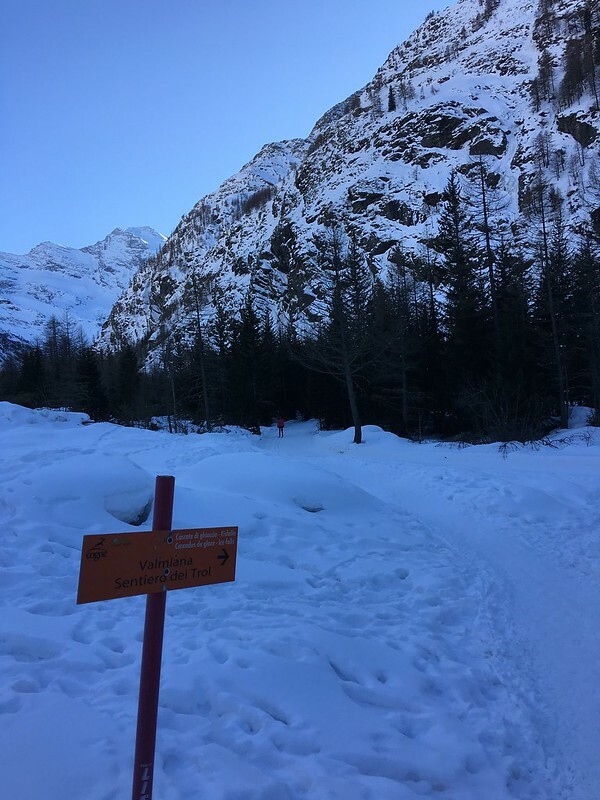 The route starts just outside Passy village and involves a 20 minute walk through the woodland to reach the crag. 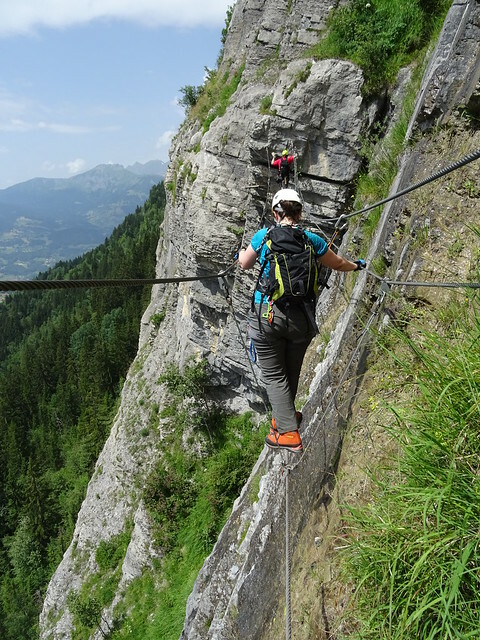 Its a great route, but unlike in the Dolomites where the via ferratas are rock climbs which are protected by a cable and with the occasional metal step to use, this is entirely on metalwear – steps, ladders and rope bridges. Which ultimately means you can get some great exposure and disco legs! 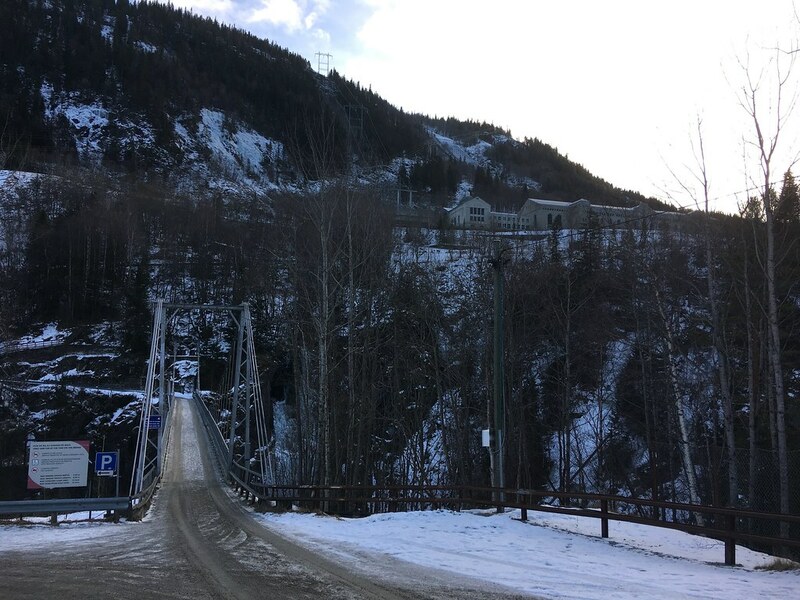 I mean why would you choose to have a join in the middle of a wire bridge so you have to let go to move your karabiners along?! 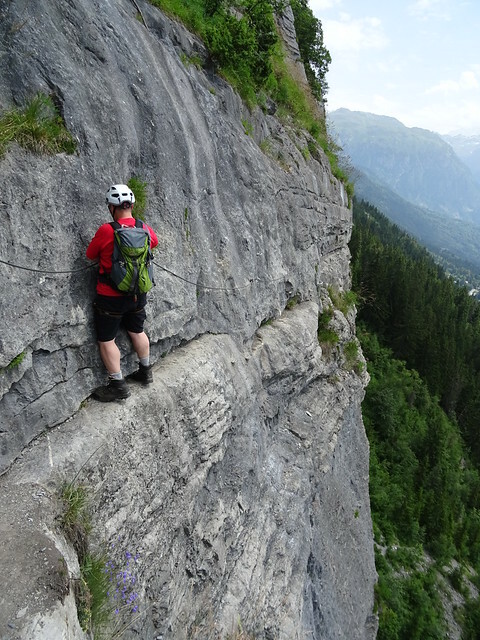 Why would you put a pin in preventing you from moving without reclipping, just at the point of a traverse when you’re holding your breath hoping there’s a metal step just left that you can’t quite see, somewhere below a handhold you can’t see either. 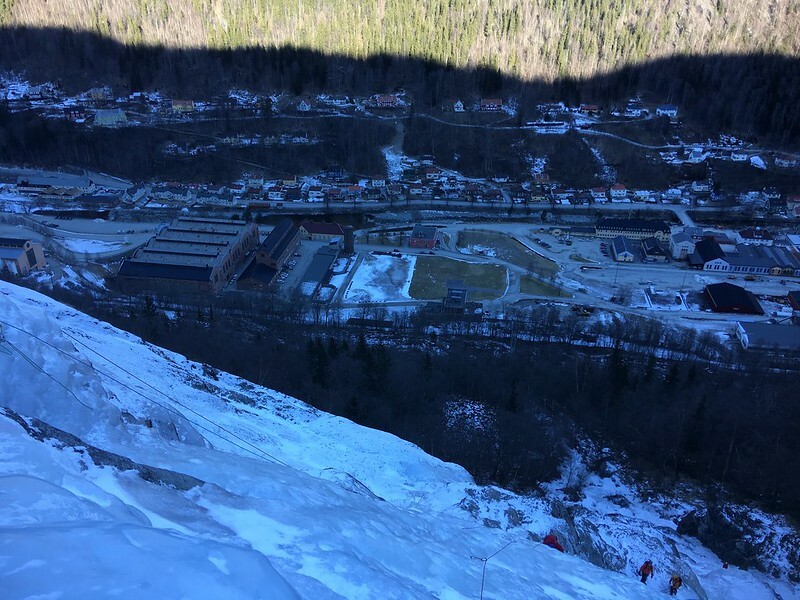 Exposure and the fear of falling is the one reason I don’t climb harder than I do currently, and you can imagine there was a fair bit of swearing from me all the way along. Some of the pins were in very awkward places to re-clip! I don’t know how I didn’t drop my camera! We were all very grateful to get to the top and head back down for ice cream and beers. 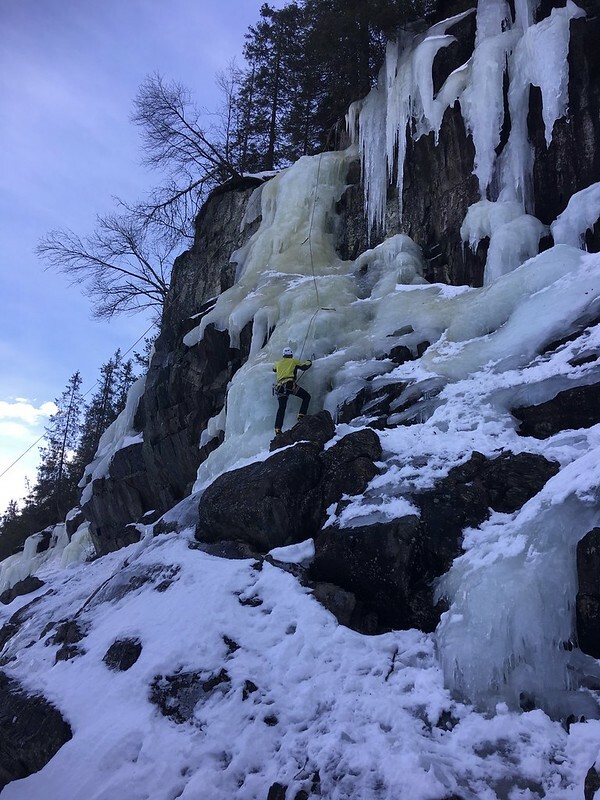 A fantastic route, but I think its at least a 2B grade!